The highlight of our week? Hands down, this is it. I didn’t shoot this video – it was taken by our neighbor, and emailed to me. Hers was much better than mine! In a full-out windstorm (blowing 25-40mph, gusting 45-55mph), we headed to Whitewater Draw Wildlife Area, hoping to see the thousands of migrating Sandhill Cranes that winter there. It was a spectacular success. But, let’s back up a wee bit. Facing a short travel day, we actually elected to take the long route to Whitewater Draw. 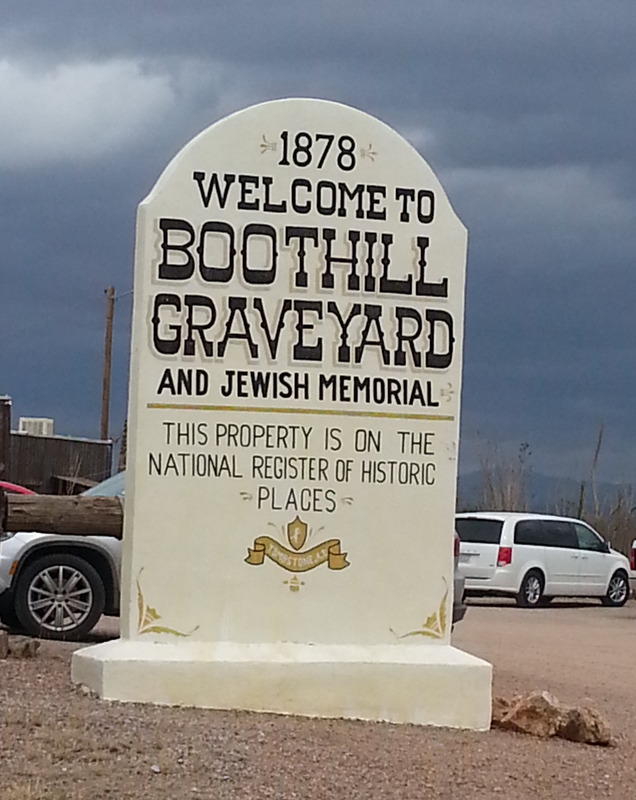 This would take us through Tombstone, AZ, home of the famous Boot Hill Cemetery, and also the location of the Shootout at the OK Corral. 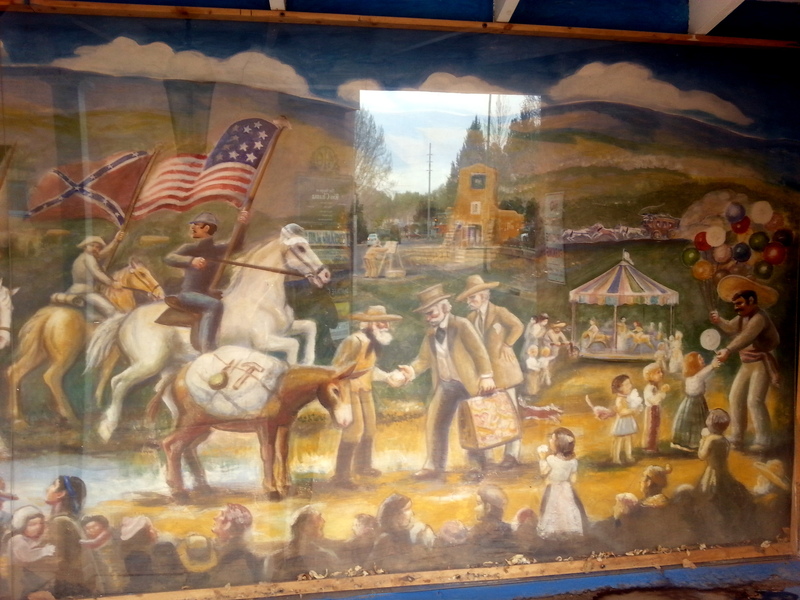 This town has more kitschy western-y stuff going on than all the rest of Arizona put together. 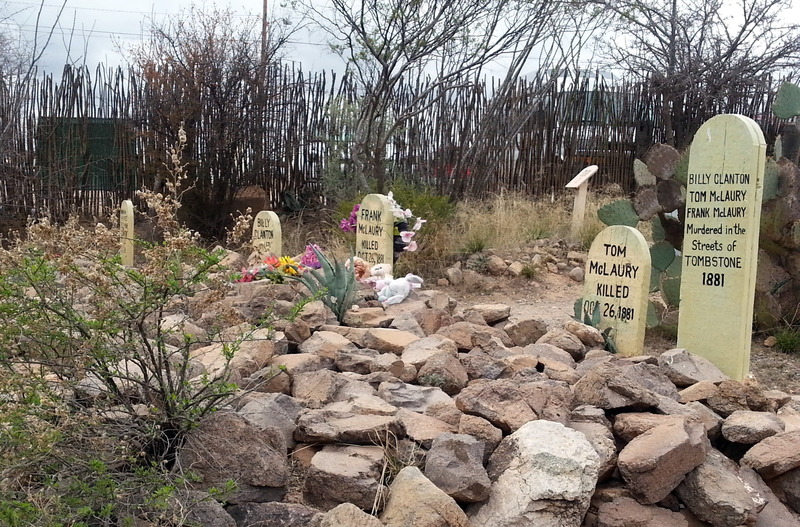 Tombstone may have been the center of the Wild Wild West back in the 1880s. To wander through the cemetery, it sure would reinforce that idea. Many of the tombstones have a name, followed by the designation ‘murdered’, ‘hanged’, or ‘shot’. 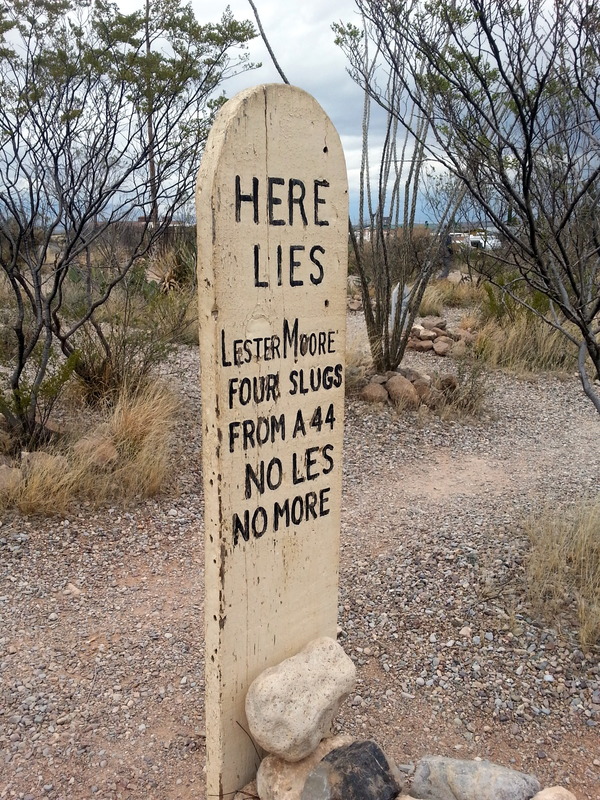 My favorite is the grave marker of the famous Lester Moore. Howling wind made it uncomfortable to stay out too long, even though the temperatures were in the low 60s. How windy was it? Ask Jezzy. 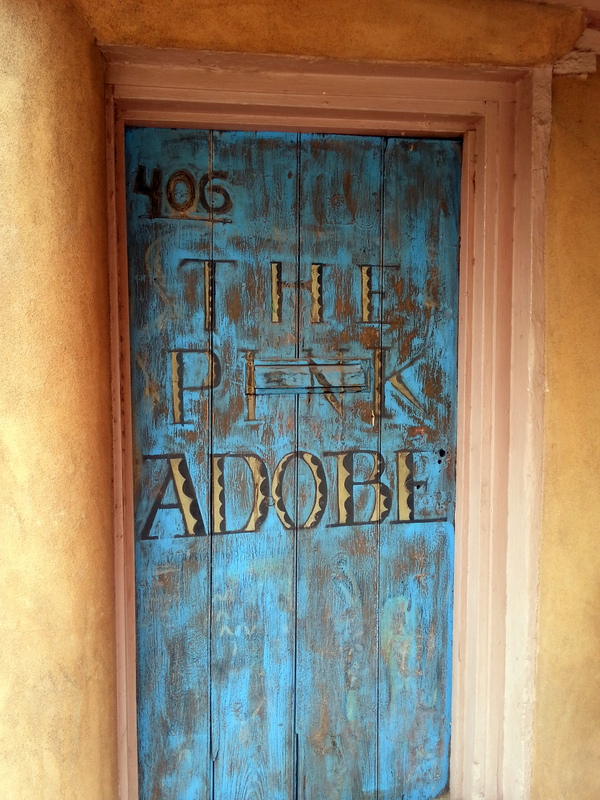 We sought shelter in Big Nose Kate’s Saloon. BNK was the girlfriend of Doc Holliday, one of the infamous participants in the Shootout. 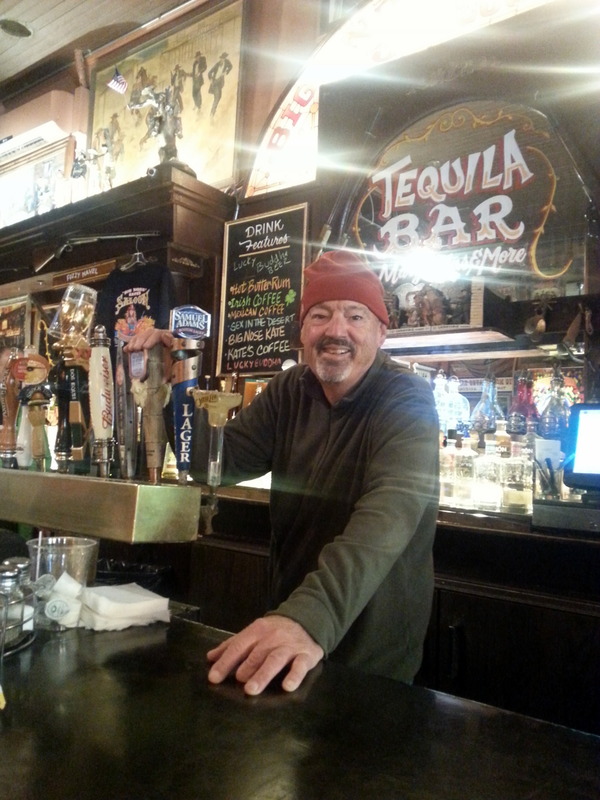 John was persuaded to step behind the bar and pretend to draw a beer for me. “Put your hand on the tap, but DON’T PULL!”, were his instructions. Maybe you had to be there to appreciate this, but the funniest thing was the stagecoach which could be hired for a brief tour. 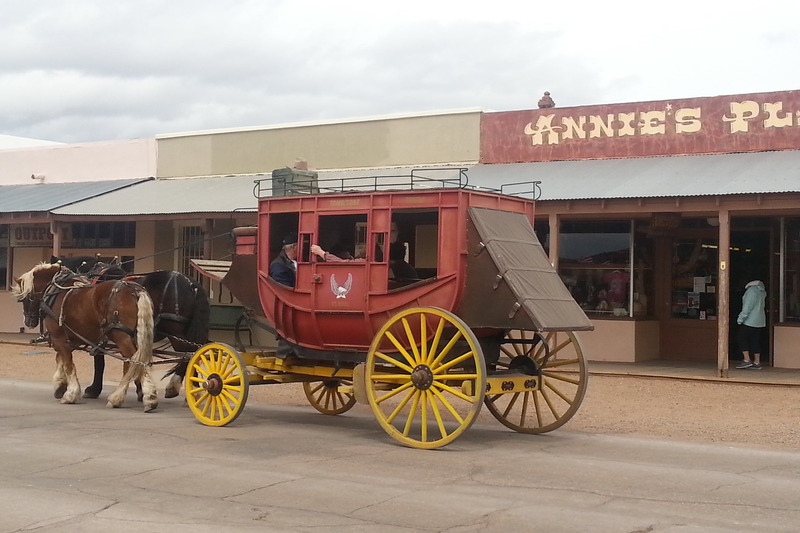 The driver, in full stagecoach regalia, was pointing out places of interest to his four passengers. But, it was a recorded presentation. That didn’t stop this driver from giving it his all – he was waving his arms, and giving a full theatrical presentation, as if he was performing at the Met. 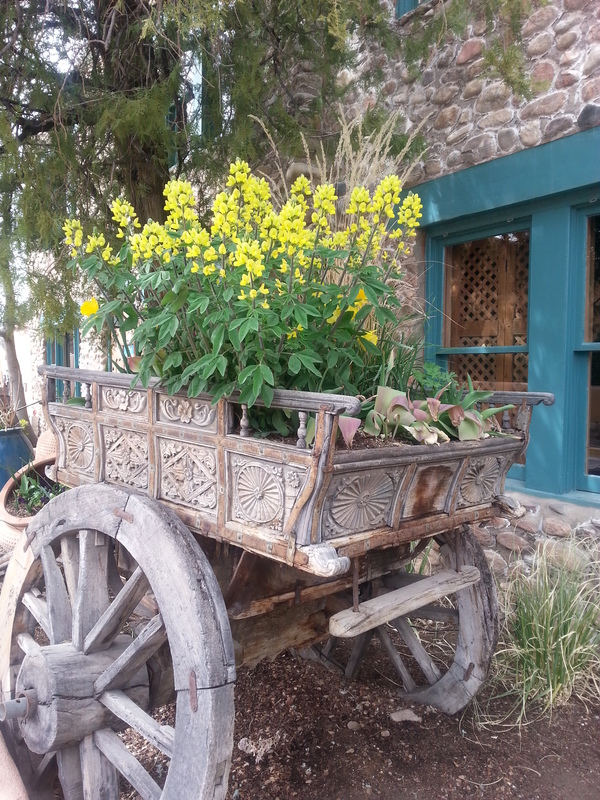 His passengers were most likely oblivious to this, being sheltered inside the stagecoach. As he passed by, John and I looked at each other and burst out laughing. 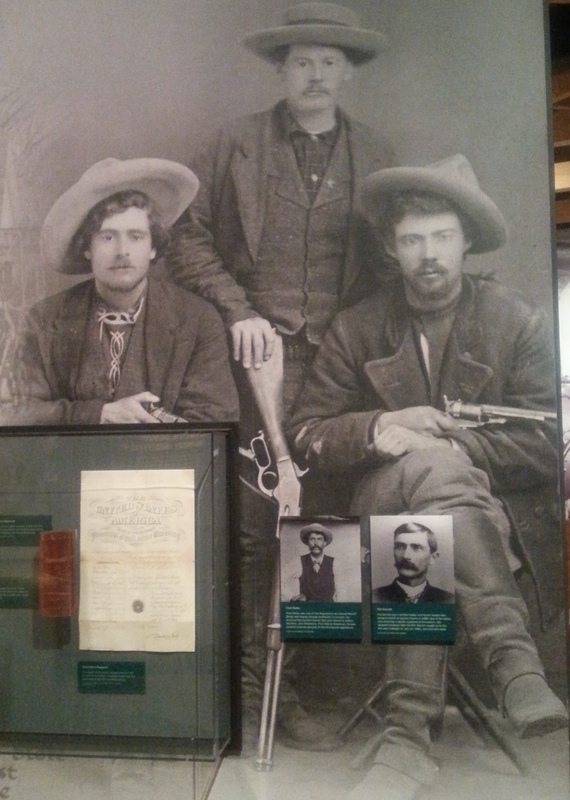 But, maybe you had to be there…… The Courthouse Museum was our next stop, where we learned everything one could possibly want to know about the Shootout at the OK Corral, starring Sheriff Wyatt Earp, his two brothers, and Doc Holliday against the bad guys, who were all killed. Wyatt Earp was the only one not wounded or killed that day. 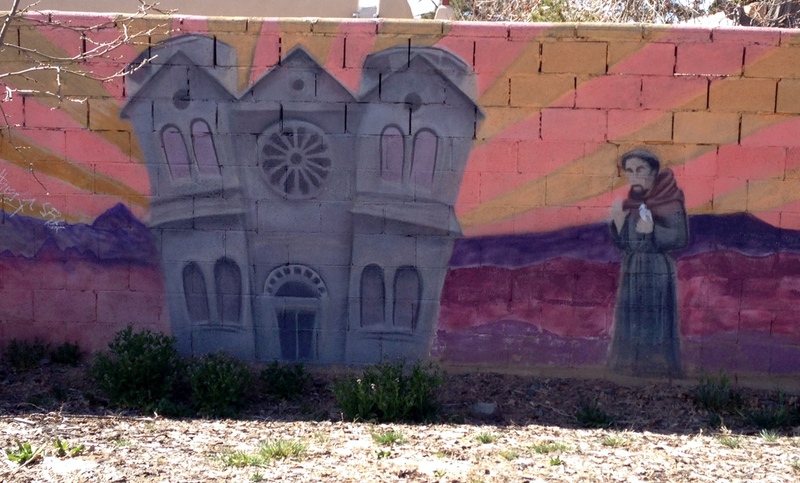 As I said, Tombstone was a tough place to live in the 1880s! We rolled into Whitewater Draw around 2:30, and established our spot in the ‘campground’. This is actually a small circular parking lot, with a vault toilet in the center, and about six parking spaces surrounding it. Other cars can pull in and park for a few hours, but this is the only overnight spot. Our neighbors were from Switzerland – halfway through a two year tour of the US. Nice folks! We knew this was a Sandhill paradise, as we follow the excellent blog of Ingrid, who describes herself as a ‘non-birder’, but who takes the most fabulous bird photos. Check out her post by clicking the link above. We quickly set up, turning the Fireball around, so that our door would be downwind. If not, we would not have been able to open it from the inside – that’s how violent the wind was. But, where are the Sandhills? We saw ZERO CRANES! Ah, we remembered that Ingrid mentioned that they depart at first light in the morning to feed in area fields, and return to the water at dusk. 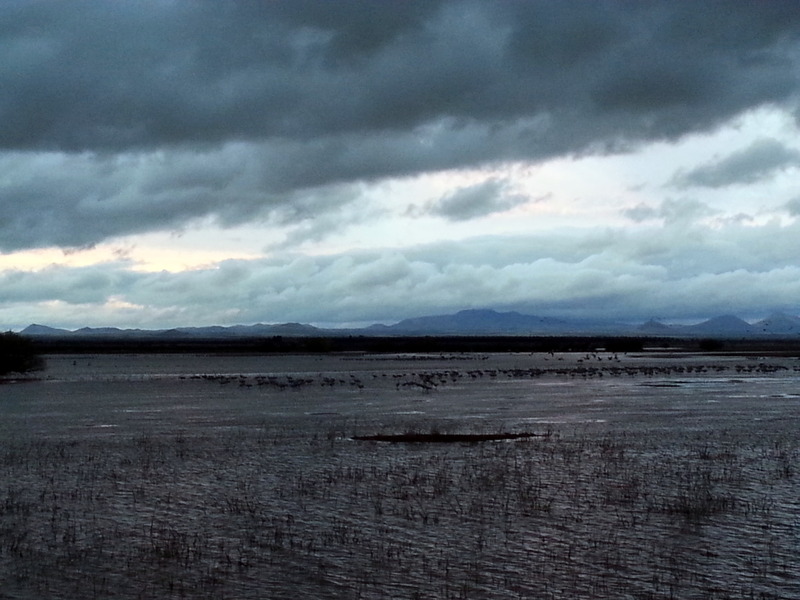 The flock here is estimated at times to be nearly 30,000 birds, although we didn’t expect to see that many. 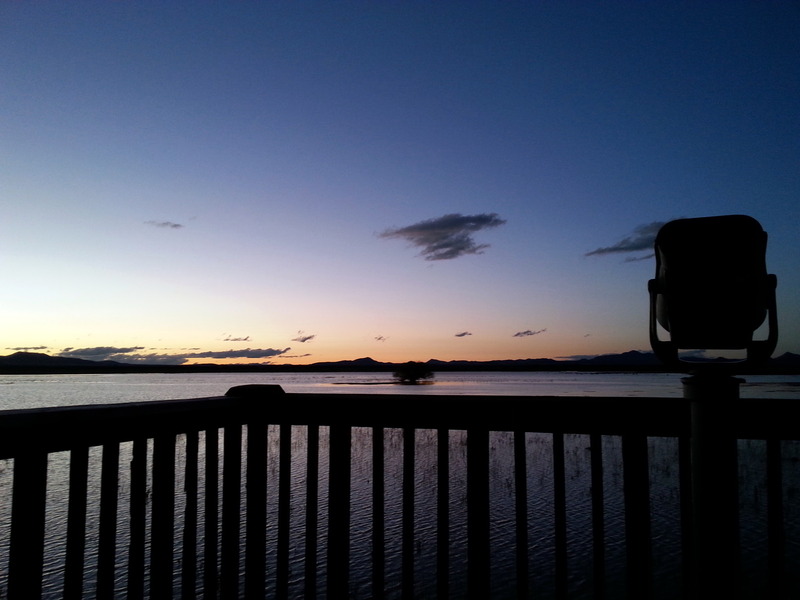 Around 5:30, we wandered down to the water, binoculars and cell phone cameras at the ready. 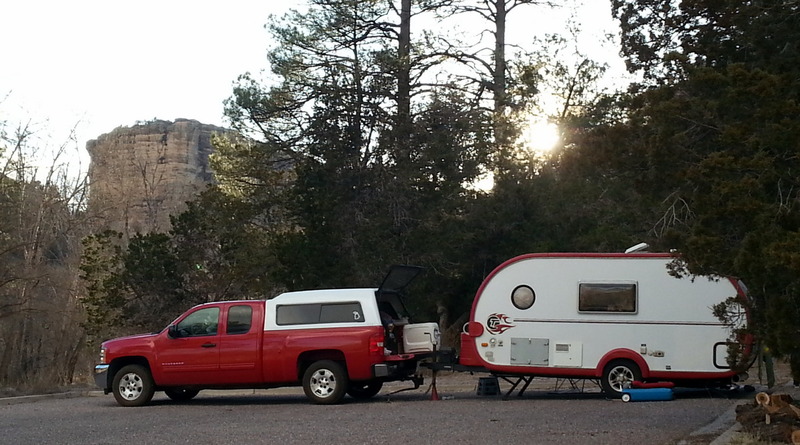 We quickly met our Swiss neighbors, and our California neighbors in the huge RV directly across the parking lot. Soon, we could hear the racket of Sandhill Cranes, coming in for a landing. They were in packs of 100-200, flying directly into the fierce south wind. Wave after wave landed, taking spots in the water, where they stay for the night. There must have been 10,000-12,000. 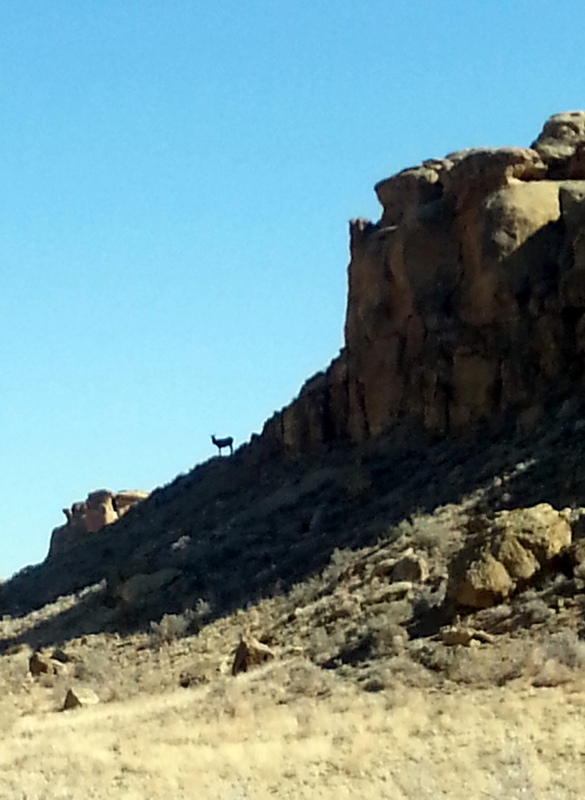 We speculated that they stay in the water as protection from predators – there were lots of coyotes hanging around, and we dreaded hearing any confrontations. Unfortunately, the very dark clouds and late hour of the day precluded any decent photos. But, we (and our new neighbors) kept murmuring ohmygawd as another batch landed. The noise was incredible!! I downloaded an app for my phone to record sound, which I did. It’s magnificent. BUT, it doesn’t allow me to share the sound files. So, if you see me sometime, ask to listen. It’s a wonderful raucous symphony. We set our alarm for 5:30 am to be sure to be out at first light. It was in the 40s and raining. But, we stuck it out, and were rewarded with liftoffs of several hundred Cranes every minute or so, heading out to feed. It poured all morning, finally clearing up around noon. Jezzy and I headed out to explore. 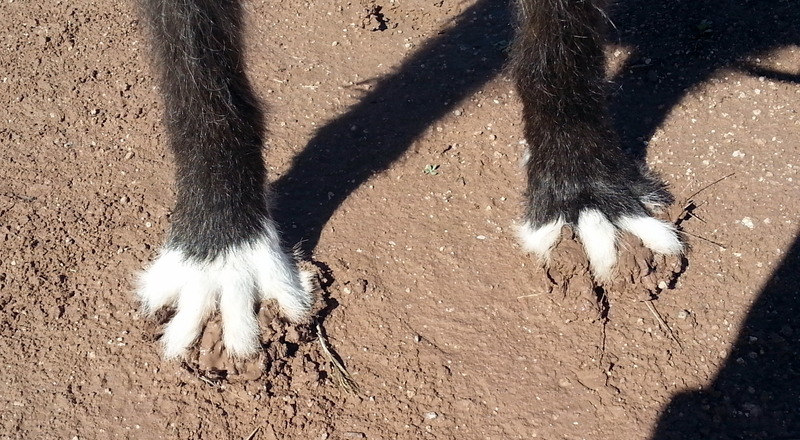 Check out these feet – would you want them in YOUR camper? We decided to stay one more night to see if we could get a better view, hoping that the dark clouds of the storm would have passed. We were rewarded, in spades! The Cranes were all huddled along the far shore when apparently a sprinkler went on in the massive field, causing the uprising that you see in the opening video. It was unbelievable. 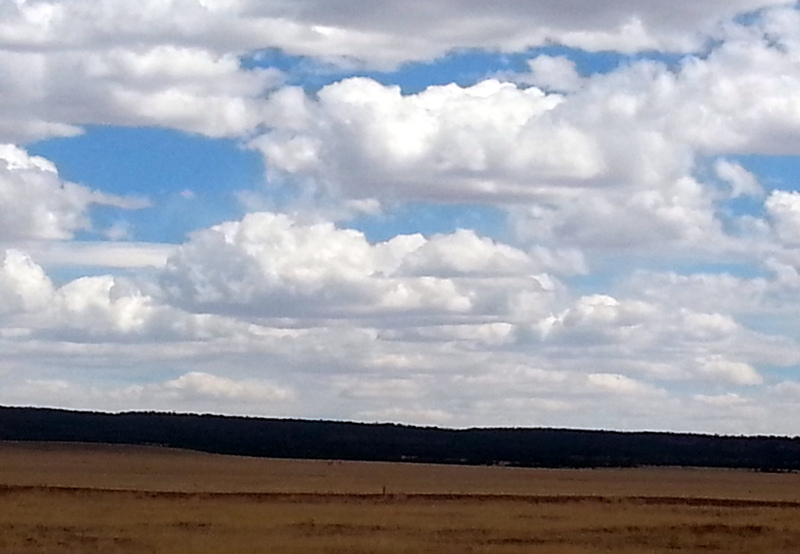 Thousands and thousands of Sandhills. Again at 5:30 the next day, we stood on the water’s edge. Cranes flew away in huge numbers, with the entire 10K (or so) leaving within a space of 10 minutes. We could see the in the dim light through our binoculars, but there wasn’t enough light for photos. I will never forget this sight. We have to move on. 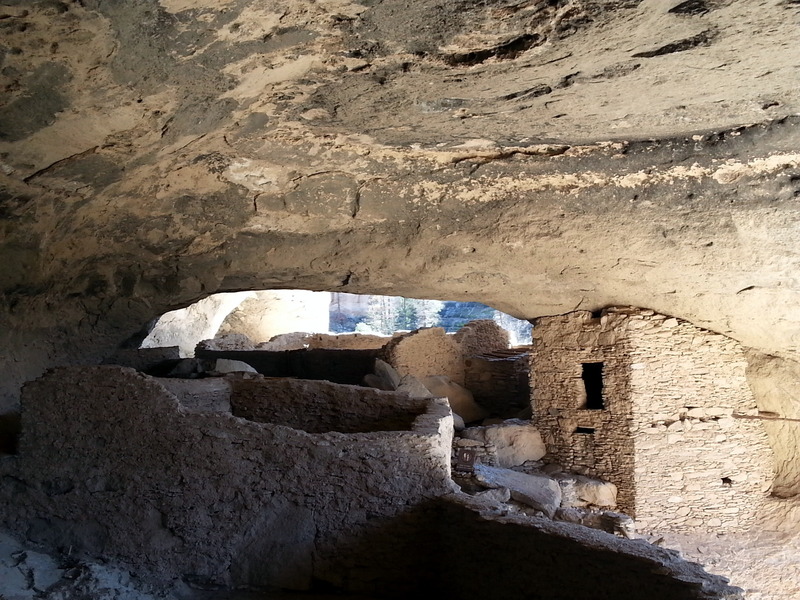 Leaving Arizona in our rearview mirror, we head to the Gila Cliff Dwellings National Monument in New Mexico. 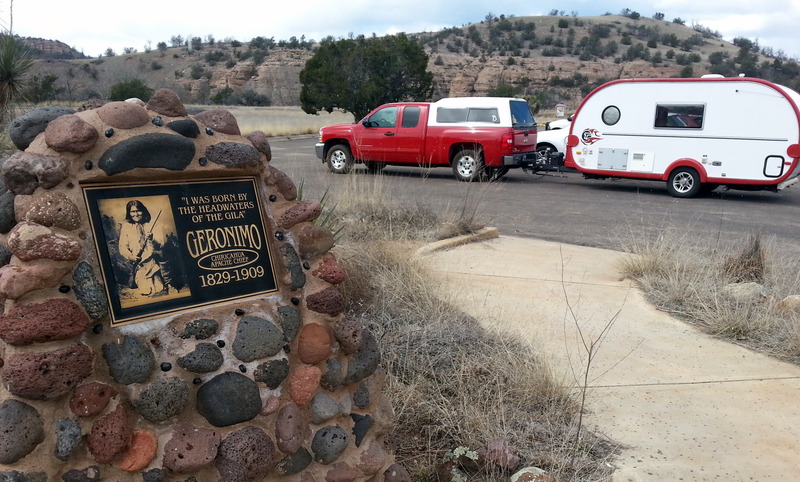 This area’s most famous inhabitant was probably Geronimo. It’s my day to drive. 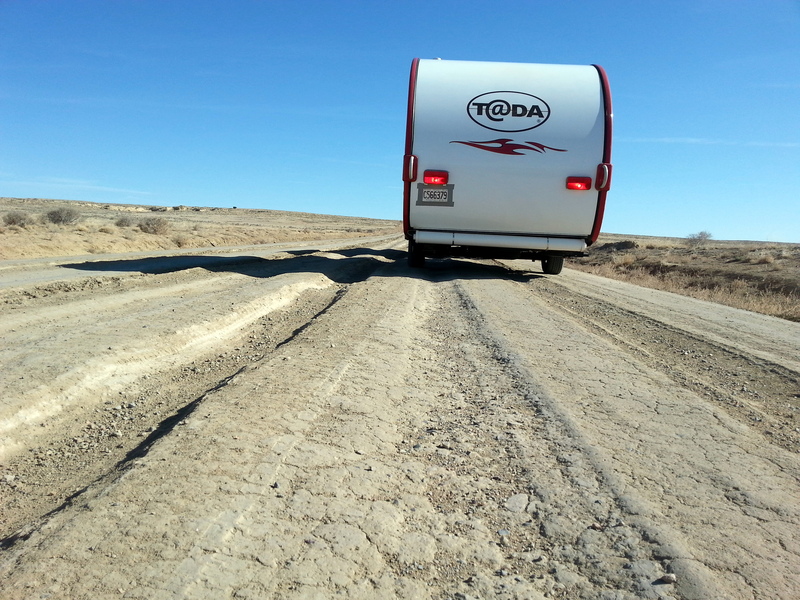 Unfortunately (for John), this involved one of the most hair-raising 40 miles of road we hope to ever travel. Twisty, turny, up and down…..it took us two hours to climb and descend into the Park area. 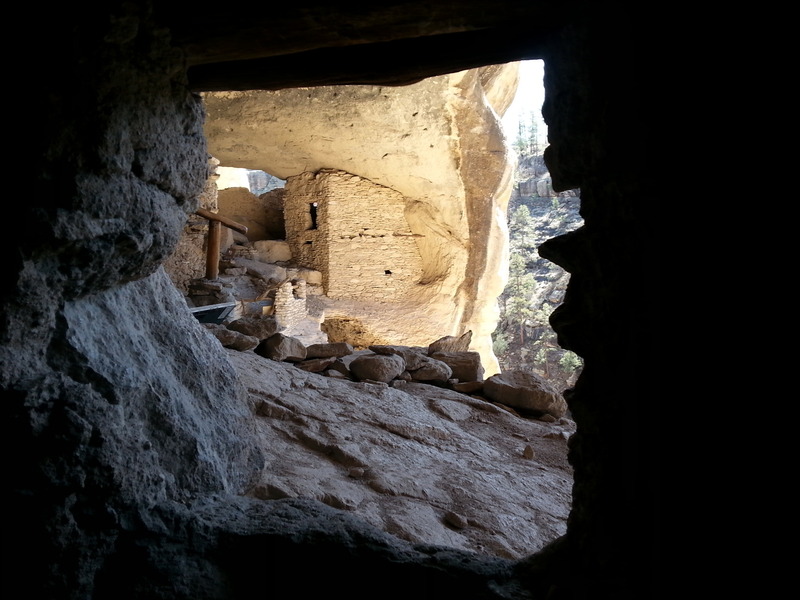 They sure didn’t build these cliff dwellings downtown! Had to pry my sweaty, cramped hands off the steering wheel. What we didn’t realize was that the ‘campground’ was (again) a parking lot with some walk-in tent sites. There was only one other camper here, so we hogged an entire corner of the parking lot and set up camp. 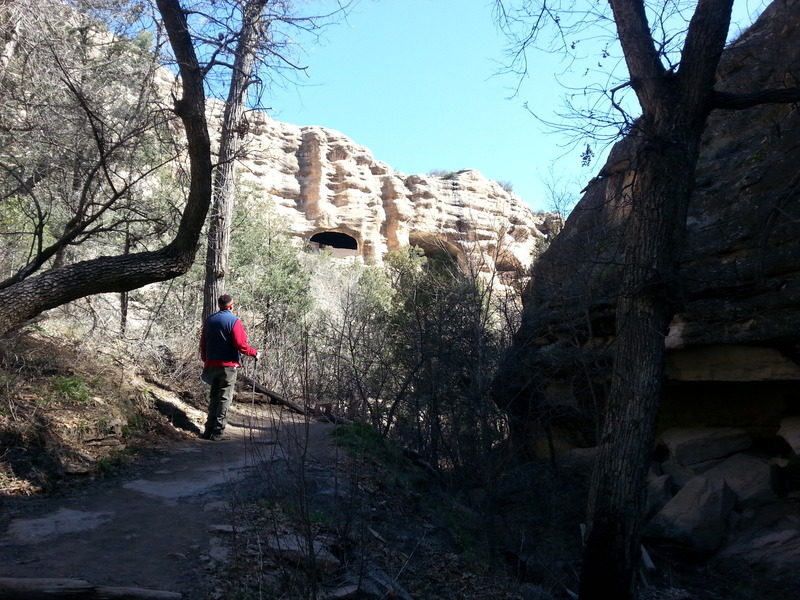 The Cliff Dwellings here are accessible on foot from a pathway about 1/2 mile from our campsite. 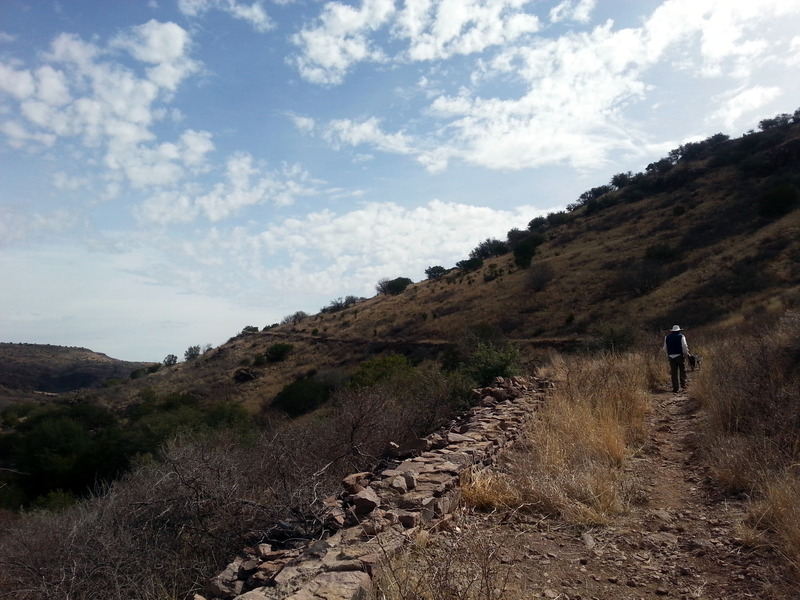 After spending a very chilly night (the temperature was 14), we set off to explore. The natural caves in this area had been inhabited over several thousand years, but were only built up inside the caves and inhabited for a very short period – perhaps as little as one generation. 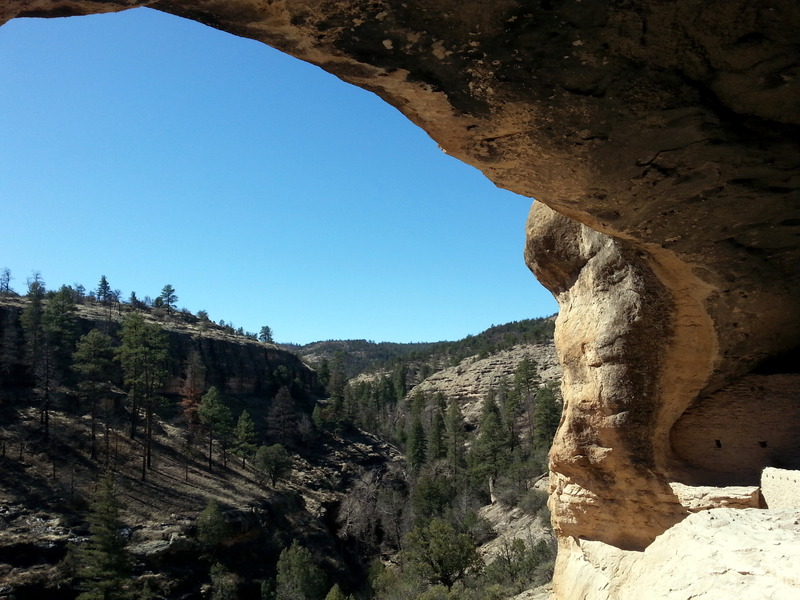 The mystery of why the Puebloan people of the Mogollon era left this area is unresolved. 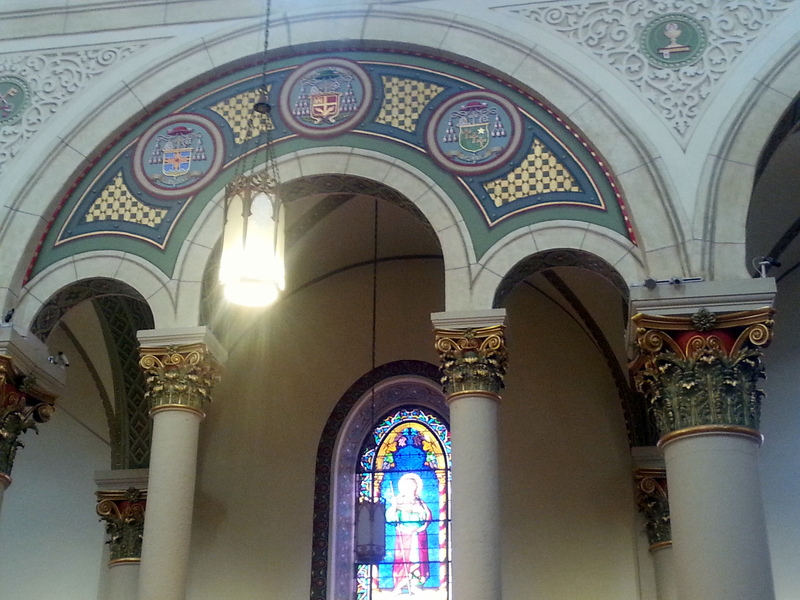 The site is spectacular, and we were fortunate to have a volunteer docent walk us through the area. He explored lots of questions, persuading us to think about scenarios that may have affected the inhabitants. Although this is a difficult area to reach, and one with limited facilities once you finally DO get there, it’s a worthwhile trip. 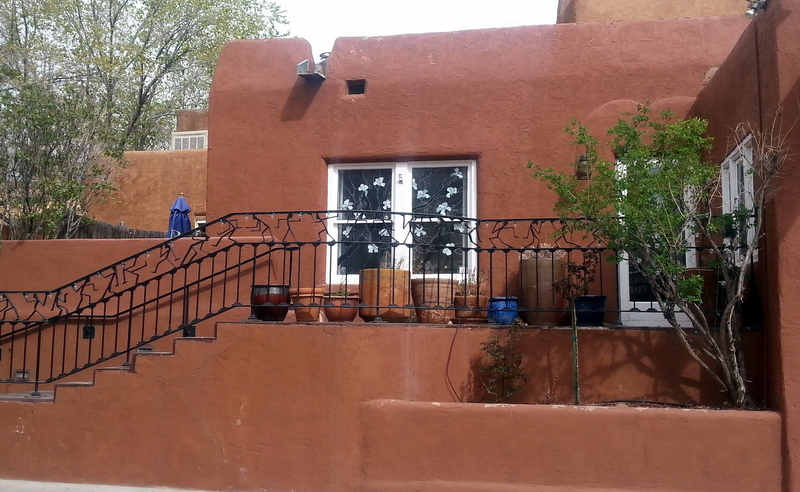 Here are several different views from the dwellings. 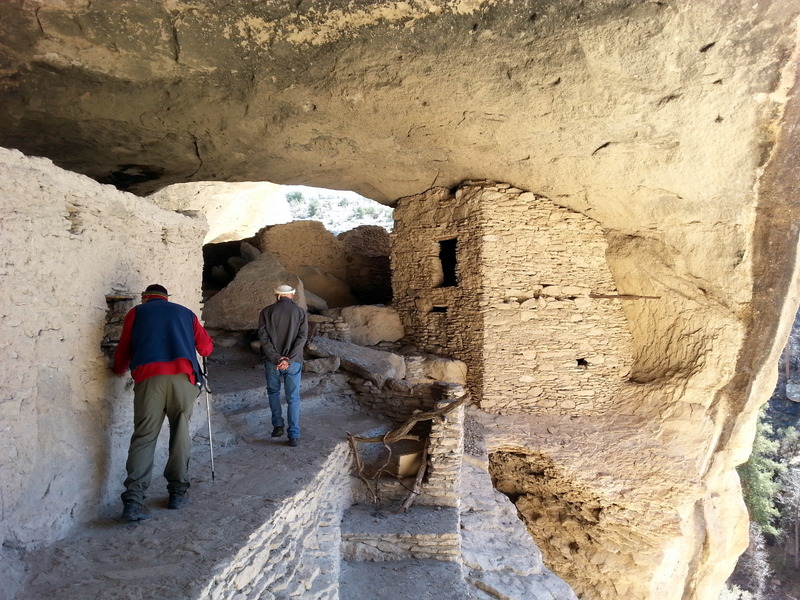 It’s interesting to note that the remnants of several thousand years of habitation in this area were destroyed by the building of the current road that leads to the cliff dwellings. Knowingly. Only in America…. Cold again at night. Minus 14. John is wishing that I would relax my prohibition on running the heater at night. It’s only 35 inside the Fireball in the morning. Fine, until our feet hit the floor! The week is beginning to blur on me. Our “3 Night Minimum Stay” policy is in the toilet after our first week. We’ve had three locations of two nights each so far, and it’s getting worse. 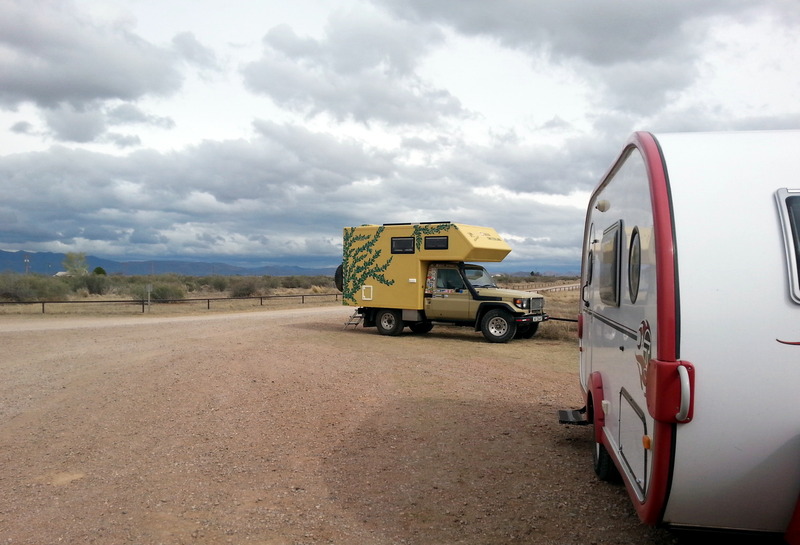 We press on to Fort Davis State Park, in the middle of West Texas. For those who haven’t visited this area, West Texas is the largest area of nothing one might ever hope not to visit. Mile after mile of……nothing. Our site is unremarkable enough, that (perhaps for the first time), we neglect to take even one photograph of our campsite. The park is very clean, but very old. Sites are small. It’s packed! Why does everyone DRIVE to the bathroom? We’ve never been in a park with so much truck traffic! omg! This early Texas State Park has many CCC buildings and features. 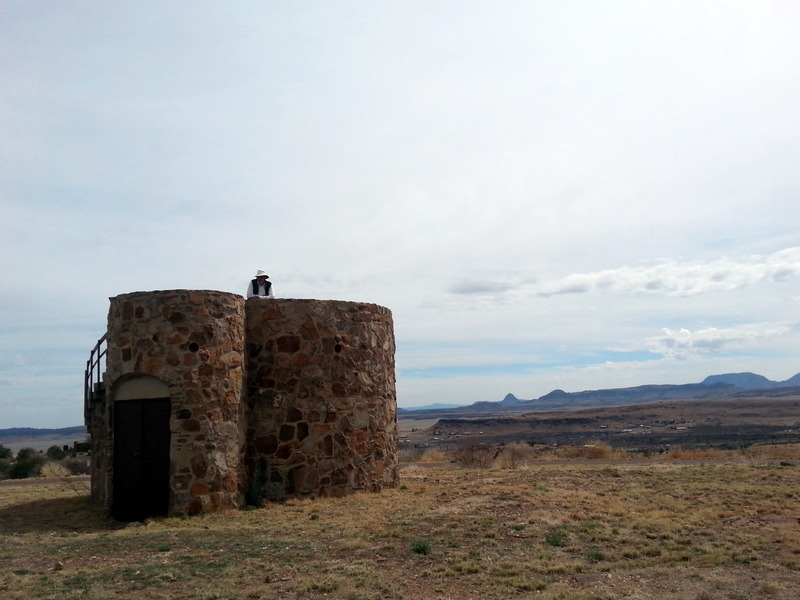 We decide to explore the Trail that leads to a lookout over Fort Davis. It’s an uneven, uphill trek. At the peak is a stone lookout shelter, with a great 360 degree view. There’s also an old CCC era stone water storage tank. 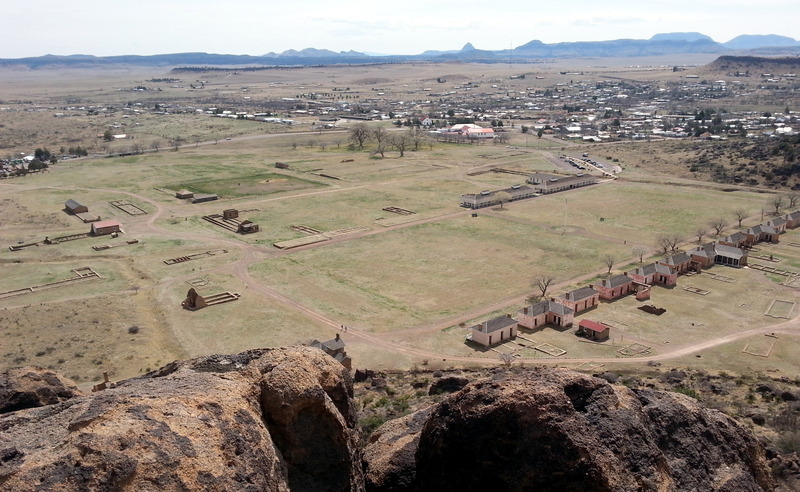 Instead of taking the 4.5 mile (long-way) return, we decide to hike out to the Fort Davis overlook. What a smart decision that turned out to be! The trail led through a lava field, with enormous black boulders squeezing a narrow trail. 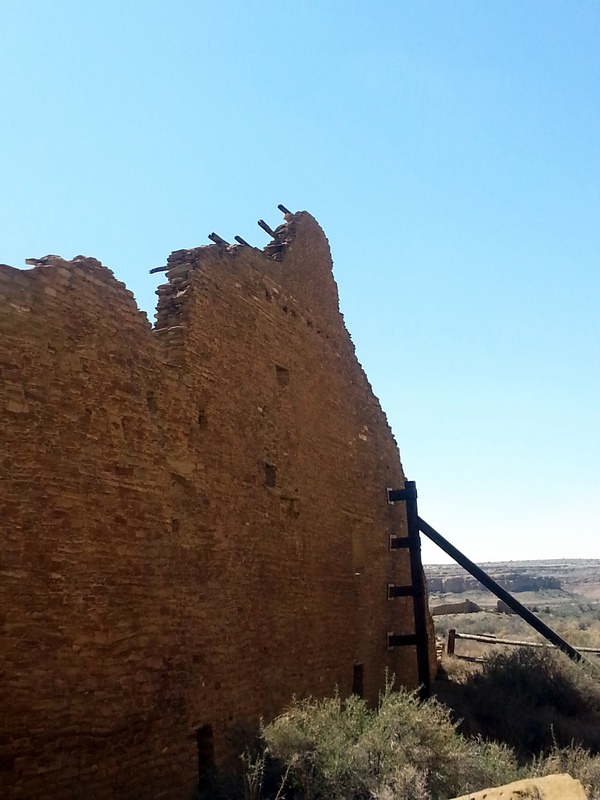 After 3/4 mile, we came to the edge of a cliff, overlooking the historic Fort, a frontier post during the Indian Wars. From our high vantage point, we can see the entire complex, and learn one very interesting fact. 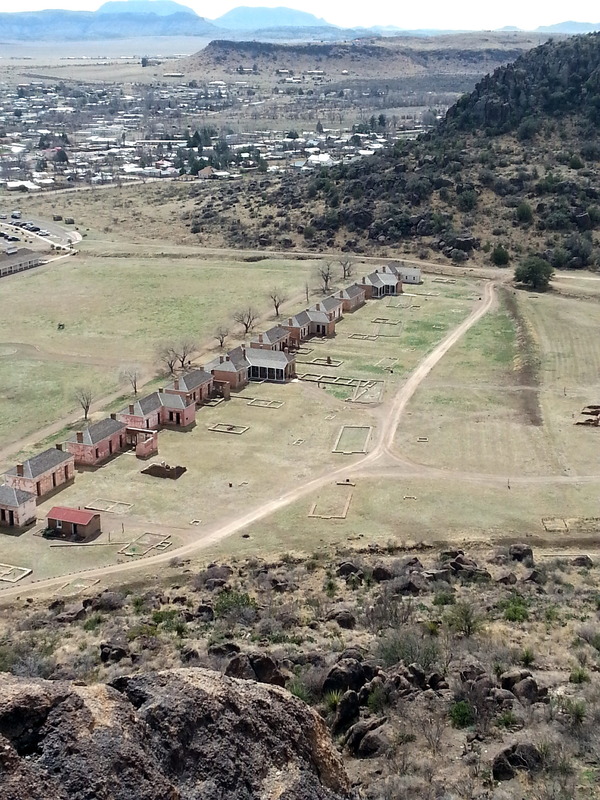 The officer’s quarters (red brick buildings in the lower right corner) were built pointing to magnetic north, while the enlisted men’s barracks (the foundations to the right of them) were lined up to true north. We loved this big view. 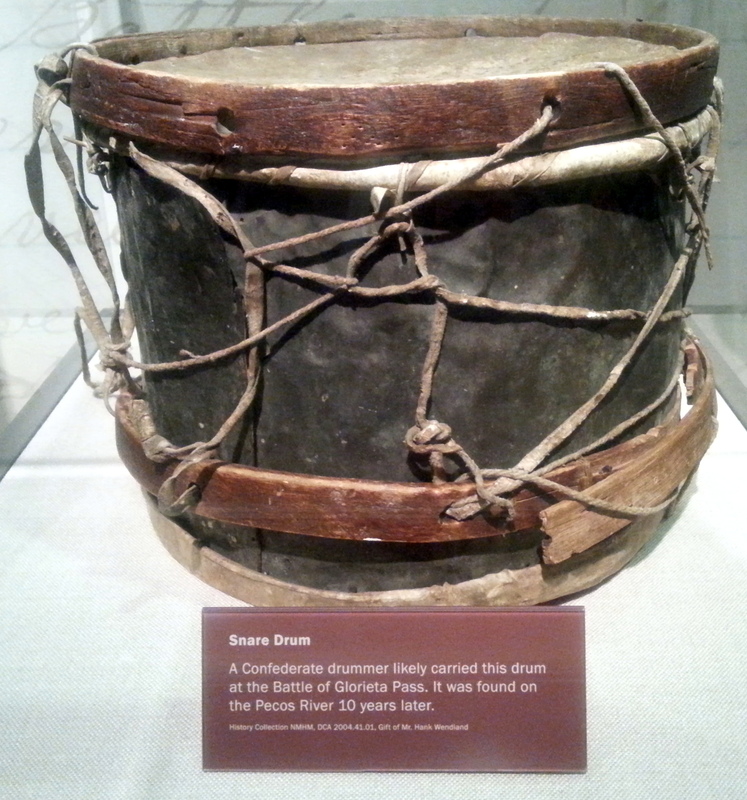 The Fort was also briefly occupied by the Confederate Army, an was decommissioned shortly after that. We’re trying to figure out how to push on to Texas Hill Country, where John wants to search for BBQ nirvana. Brisket! Bummer for us, we badly need to find a laundromat. One of the pitfalls of having a tiny camper is the equally small amount of clothes we can pack. We’re good for about a week between laundry stops. Out here in West Texas, there are few towns large enough to support a laundromat, so we find ourselves camped for the night in Fort Stockton at the RV Park. Yikes! A couple hundred large rigs and us. The RV three slots away has painted on the side, “Private Coach Not For Hire”. We think we’re going to hand-letter a candy wrapper with this, and tape it to our door. Ha! Headed toward Austin for a couple of days. 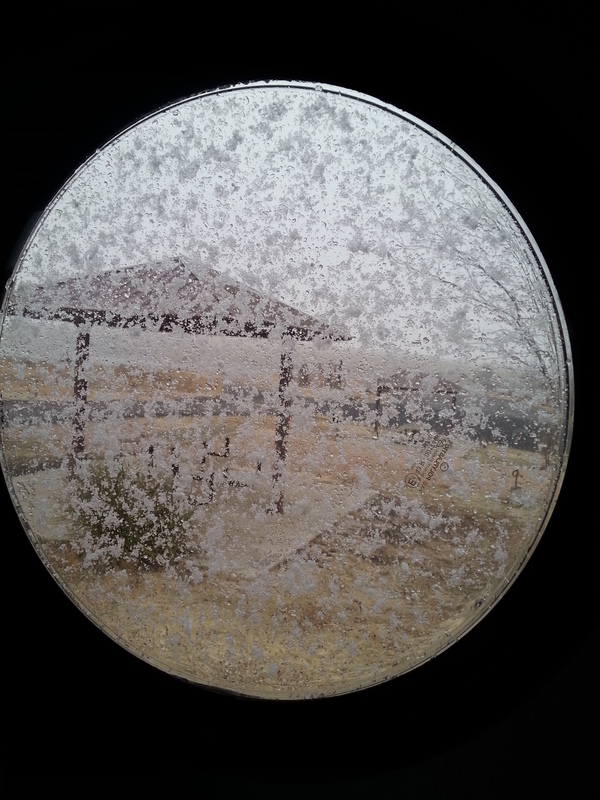 We’re in the middle of an endless TX Spring Break. There isn’t a State Park campsite available for the next two weeks (and we purchased a TX State Park pass for $70!) We can get one night here, and one night there, but we’re exhausted with the effort of driving and moving. Hope we can figure this out! 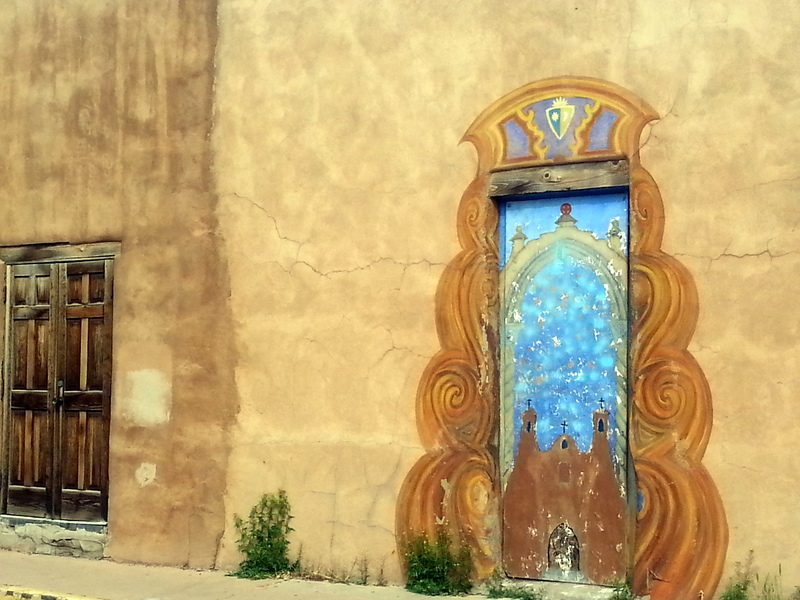 Like so many other spots we’ve been, Santa Fe was one more place we hated to leave. Return trip is a must – at this rate, we’ll spend the rest of our trips forever revisiting spots we’ve been to one time before. How will we ever see anything new? Naturally, we decided to take the roundabout way to our camping destination. 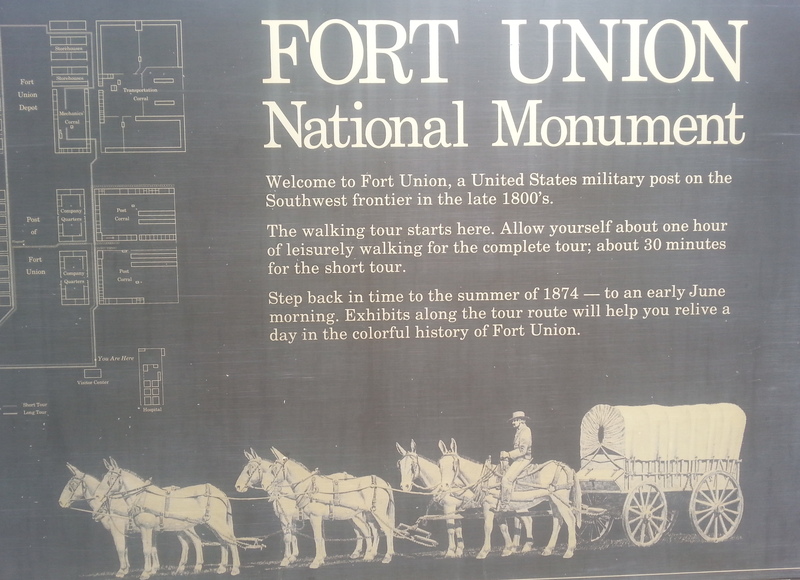 So, our first stop was Fort Union National Monument, a US Military post in NE New Mexico from 1851 to 1891. 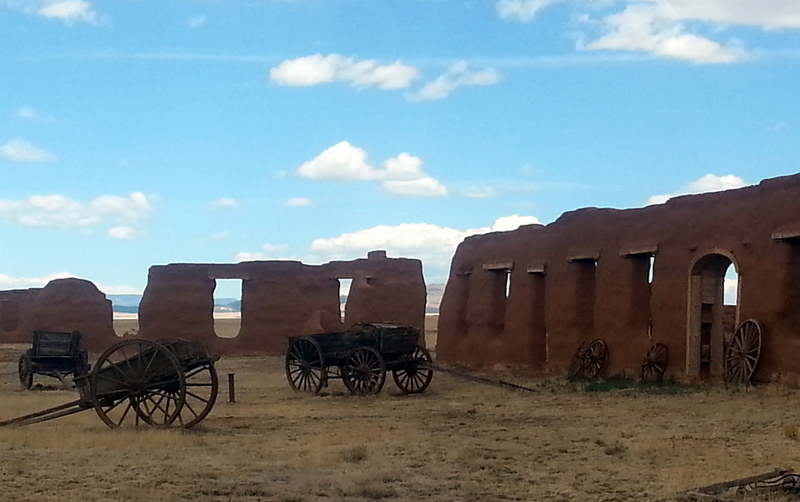 Perched right on the Santa Fe Trail, its huge storehouses made it an important supply depot. The only hospital for miles was also located here, with non-military patients paying $.50/day for treatment. 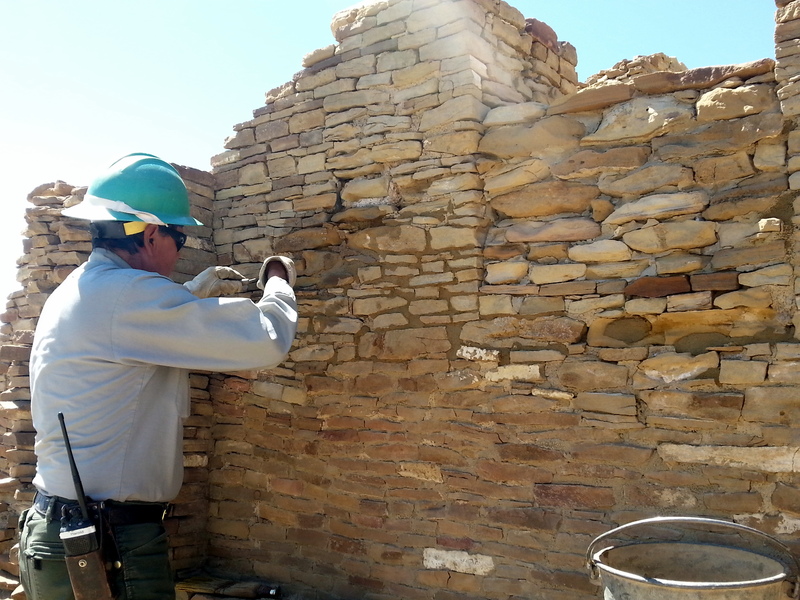 Preservation began in the 1930s, although much of the huge site had deteriorated by then. 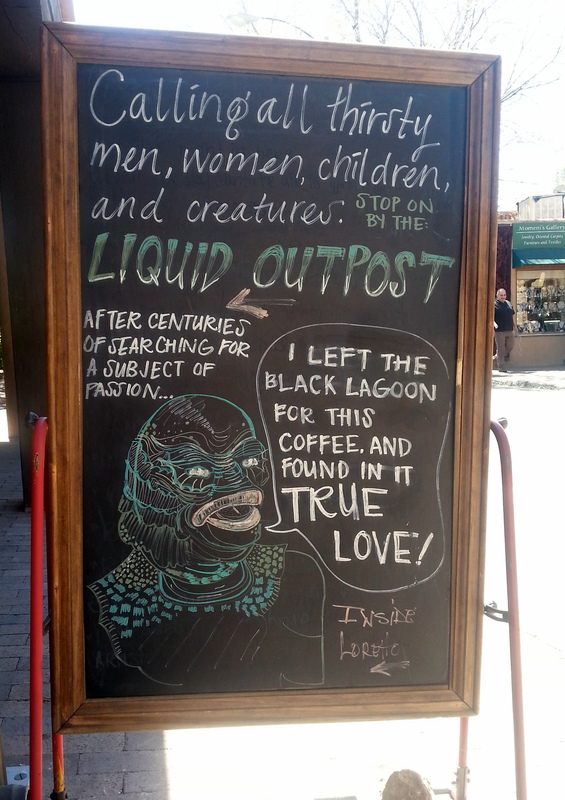 It was an interesting morning in a lightly-traveled spot. 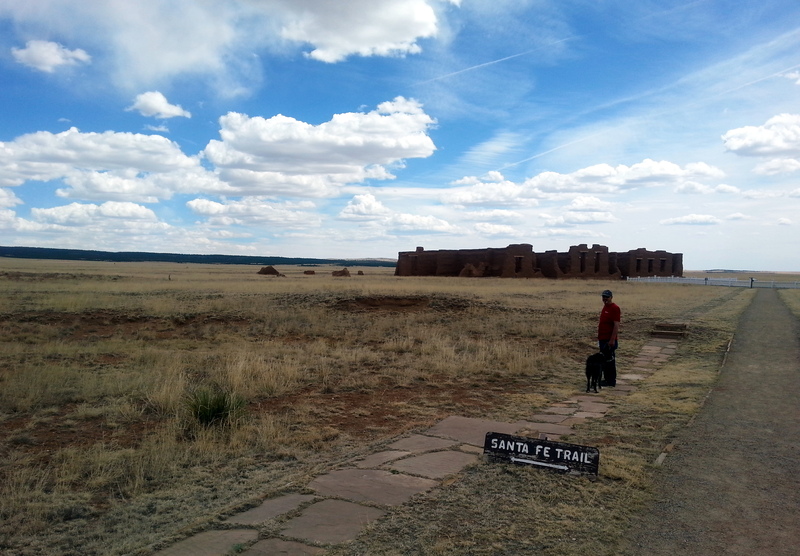 One of the things I loved most about this site was that we could see the ruts of the Santa Fe Trail, although wagons had been gone for decades. Unfortunatey, none of the photos I had picked these up, although they were clearly visible with the naked eye. 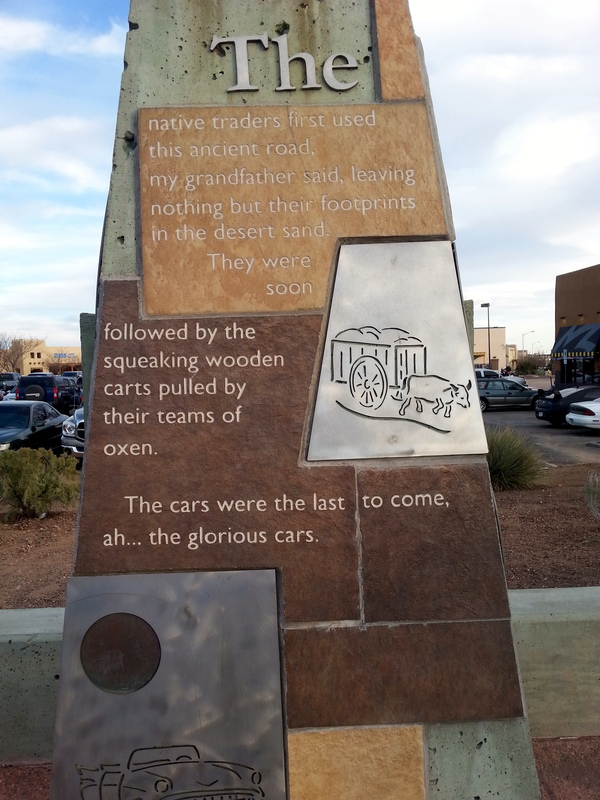 We were amazed that the wagon path could still be detected over a century later. Our find of the day perhaps was the National Park System Map we picked up for $1.75. Now we have a visual guide for all the National Parks and Monuments – an actual map with the locations pinpointed. We are happy map people. Sometimes you just need a paper guide. Going to try to hunt them all down. Too many are lightly traveled – like this one. 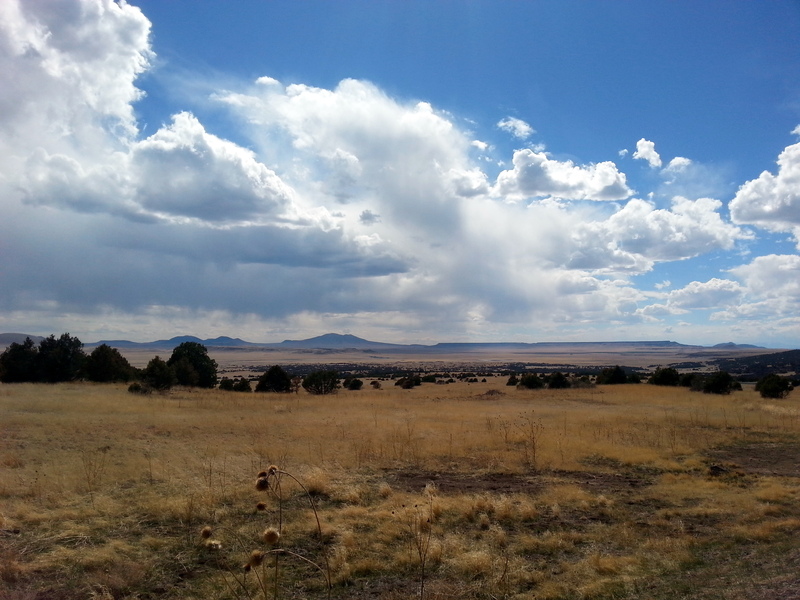 Armed with our new map, we discover that we can go only 60 miles or so out of our way to visit the Capulin Volcano National Monument. Off we go. Along the way, see piles of lava rocks alongside the road in one of the most eerie landscapes ever. Bright blue skies with puffy white clouds, bright golden fields of prairie grass, and an absolutely flat surface, save for the occasional extinct volcano scattered around. It’s bizarre. 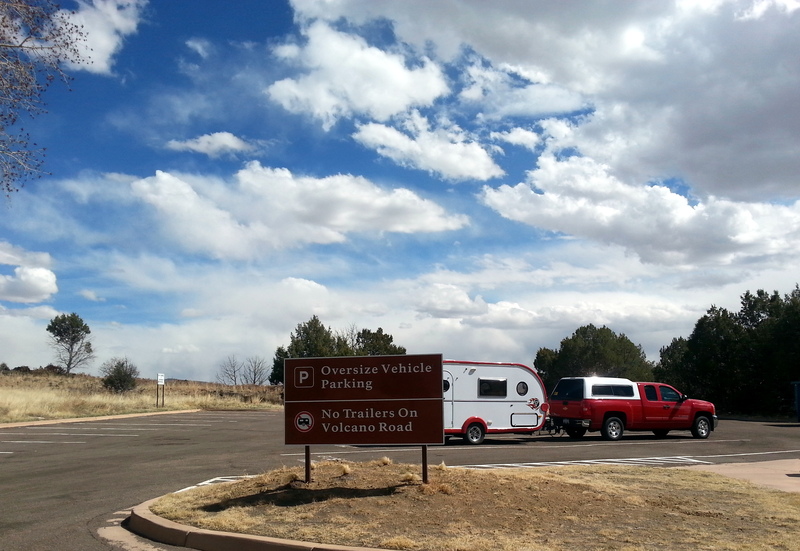 Who knew that New Mexico had an entire line of volcanos? 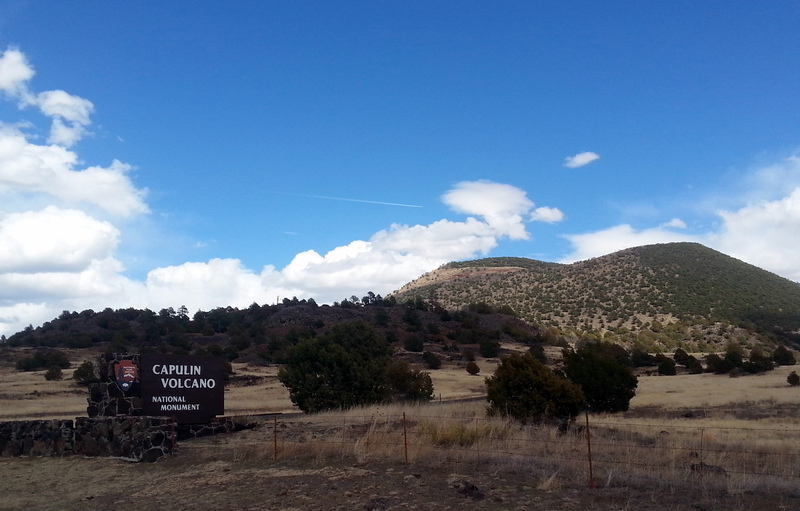 Capulin is the most recently active of these – erupted 50,000-60,000 years ago. We watched the movie at the Visitor Center and perused all the exhibits. But, in order to take the scenic drive to the top, we would have had to unhitch the Fireball. We agreed that if it would have been bare volcanic rock – we would have done it. 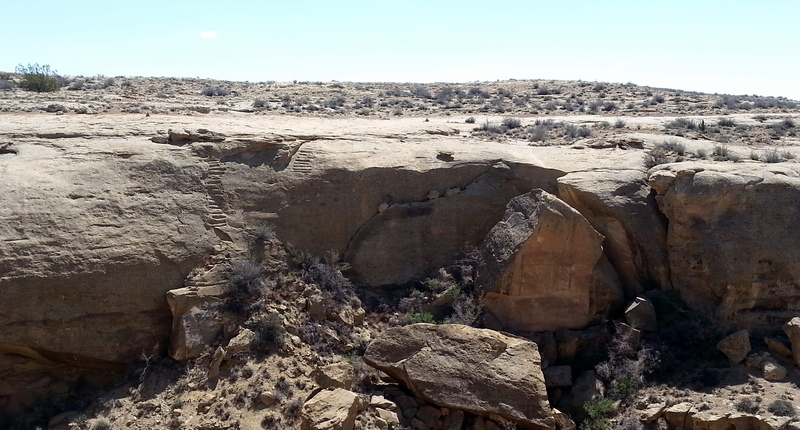 But this particular site has already grown over with shrubs, pinon pines, and other high desert plants. We grabbed a brochure and headed on our way. At this point, the wind was picking up, and we were getting biffed furiously around. 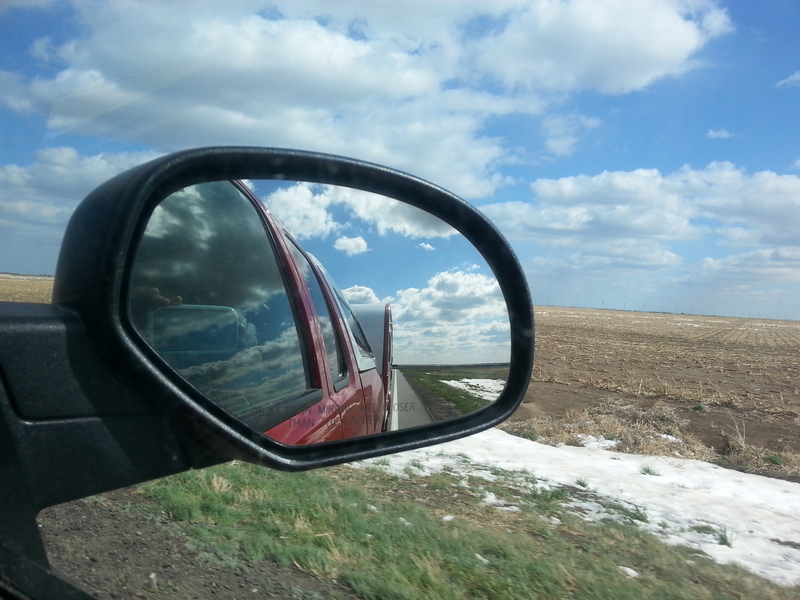 The bonus to this was that we passed an area where we saw an updraft that was completely filled with tumbleweeds. 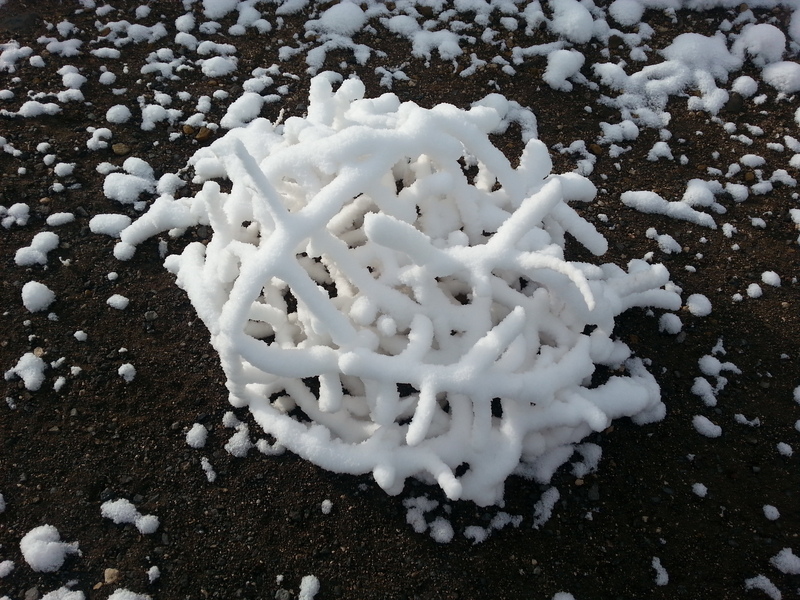 A tumbleweed tornado. By the time I grabbed my camera, we were passed, and it was gone, but we had an amazing sight for 20 seconds of a huge cyclone of tumbleweeds, high above the ground. You’ll just have to take my word for it. Clayton Lake State Park was our destination for the night (and for Sunday as well). 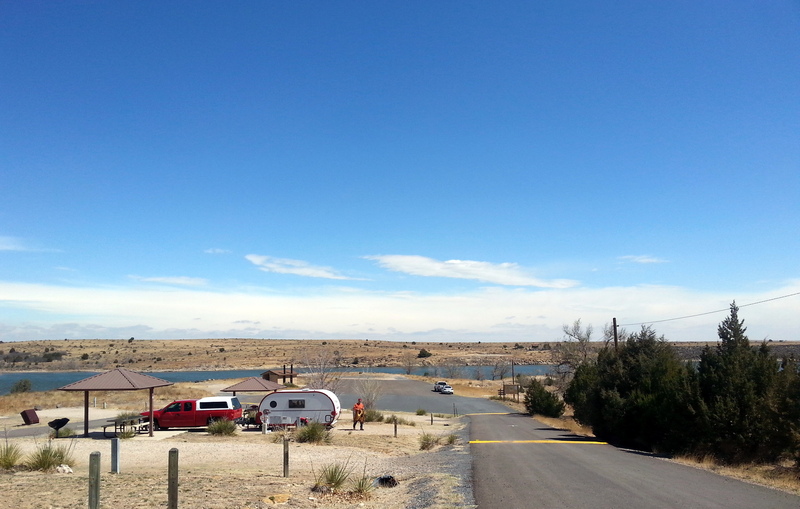 Formed by a dam, Clayton Lake is a fisherman’s dream. We watched several boats on Saturday afternoon pull out, having caught their limit of trout (5/person/day). The two other campers there were both frying fish for dinner. We hung out with pathetic looks and empty plates, hoping for a dinner invitation, but it was not to be. 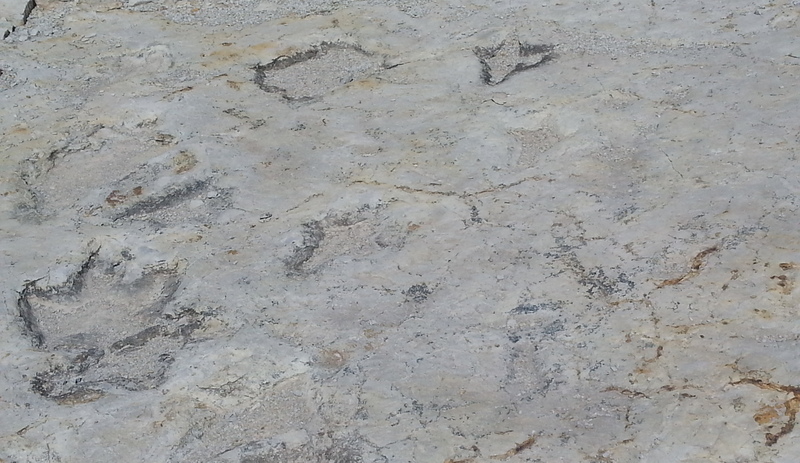 Sunday morning, we decided to explore the Dinosaur Tracks(!) at the Park. After the dam was built, the spillway was bulldozed. 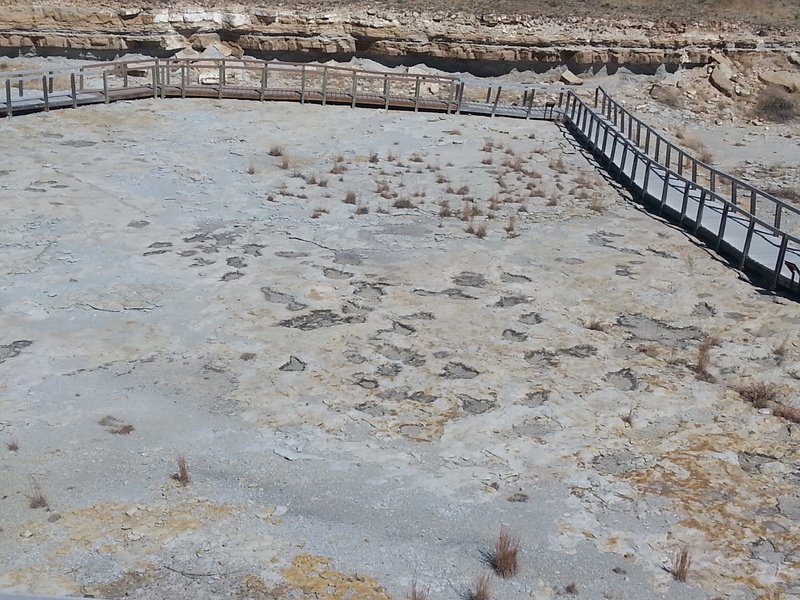 The spillway floor eroded, exposing dinosaur tracks that are 100 million years old. From an overhead viewing station, there’s a good view of the entire area, and a boardwalk around the edge gets us up close and personal. 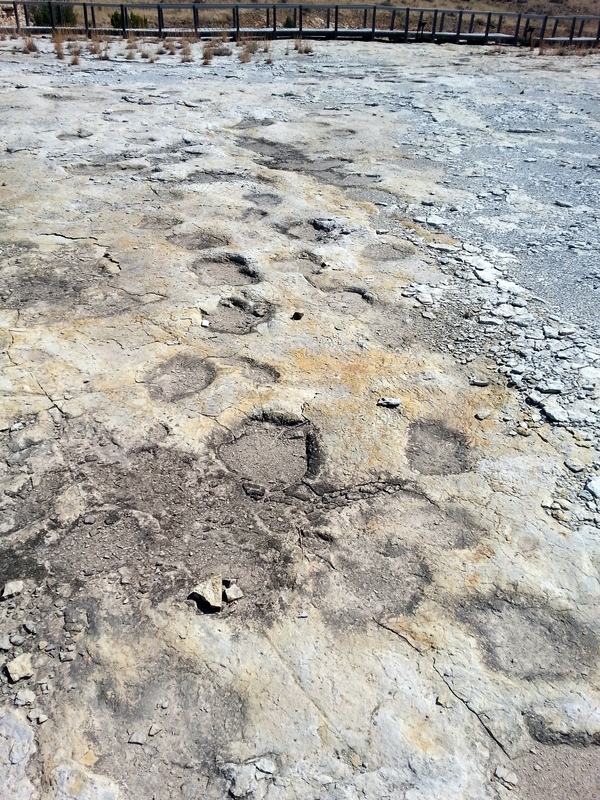 One particular three-toed track really captured our imagination. We dangled our binoculars out next to it to capture the enormous size. Amazing. Winter weather warnings have us concerned. 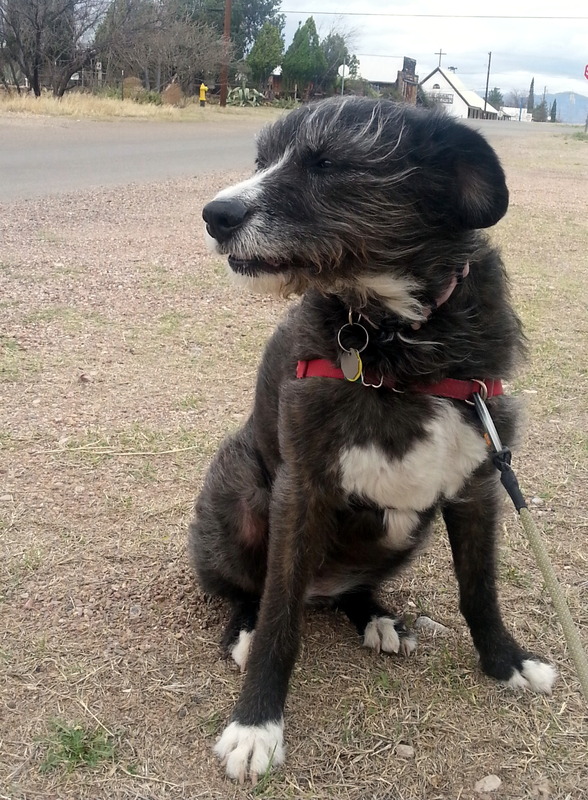 During the day, we battled 40mph wind gusts, which are not uncommon in the Southwest spring. But, there’s a winter storm warning. The only other campers here abandoned their big 5th wheel trailer, and headed to Dodge City for the night and a warm hotel room. We’re here by ourselves, and it is roaring outside. We can barely open the door. We disconnected our water, put antifreeze in our toilet, and are hunkered down for the night. This shot is about 6pm, out our porthole window. It’s blowing snow straight sideways. Prediction is 4-6” of snow, with temps in the 20’s or teens. We’re hoping we can get out in the morning. 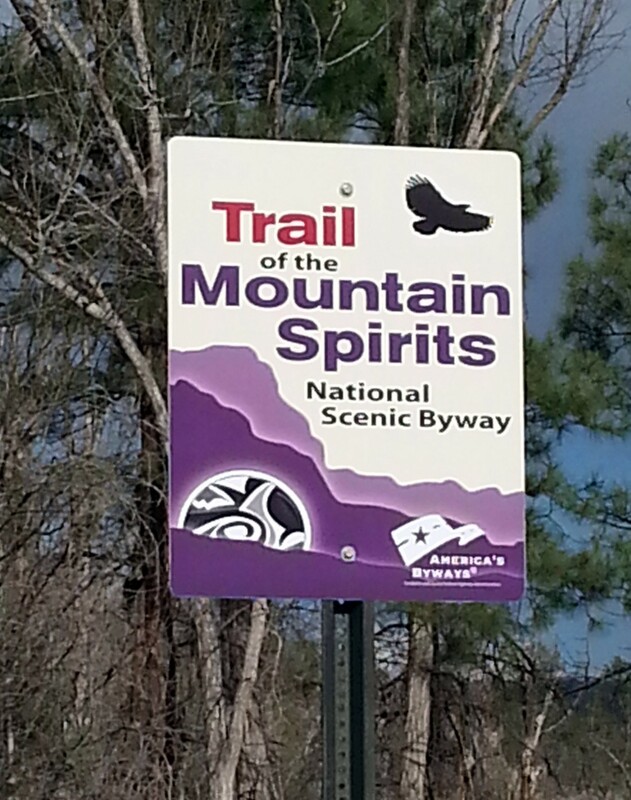 It’s uphill between us and the Visitor Center, and uphill again to the road out from there. Ugh. Monday morning, we awoke to this. 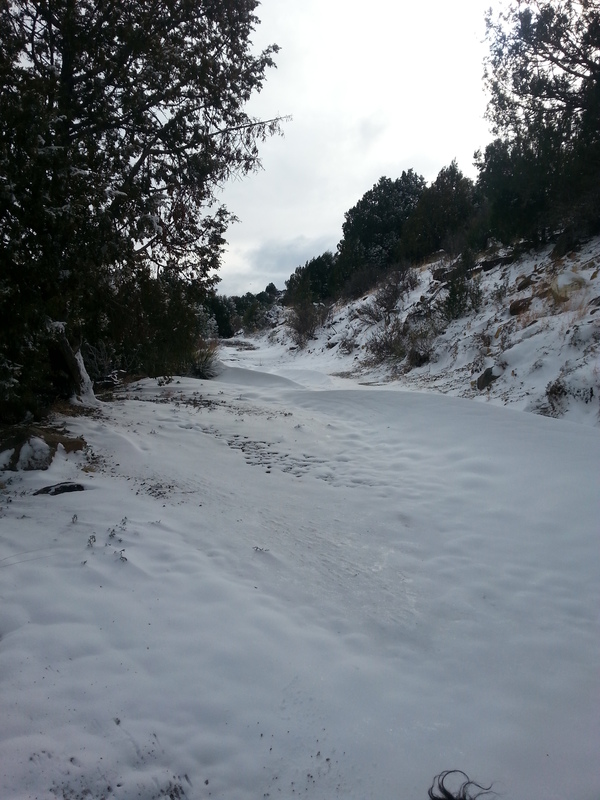 The Park Rangers (with their 4-wheel drive trucks) tell us that we have NO CHANCE of getting out of here with our 2-wheel pickup, trailer, and puny tire chains. Pure ice! We resign ourselves to a solitary day/night. It’s still whistling outside, and the windchill is -19 (according to the one radio station we can get). We resign ourselves to the day – hiking up for a mile to the one point where we have a bit of cell service to send a text message to folks who might wonder where we are. Freezing, but beautiful. Snowy tumbeweeds are everywhere, less of a nuisance when frozen than not. Hey, New Mexico sun! Thanks! By 1pm, the dark pavement has de-iced itself, and we decide to bust out and head to our next destination in Dodge City, KS. We see snow nearly all the way there, and it’s cold. But, we’re not stranded. After days (or maybe a week without basic services) we find ourselves at an RV park just on the southern edge of Santa Fe. Electric! Water! Sewer! WiFi! (probably the piece of this that we appreciate the most). 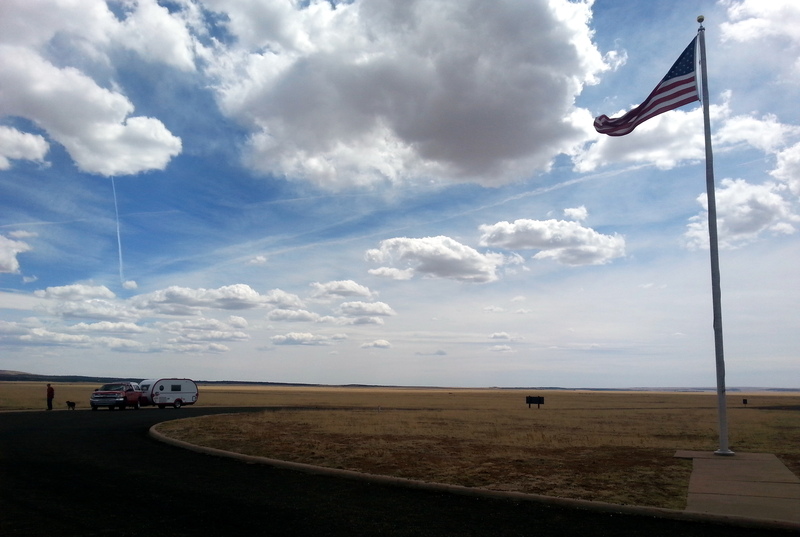 It’s our style to hang out in RV parks, but sometimes it’s all about location. 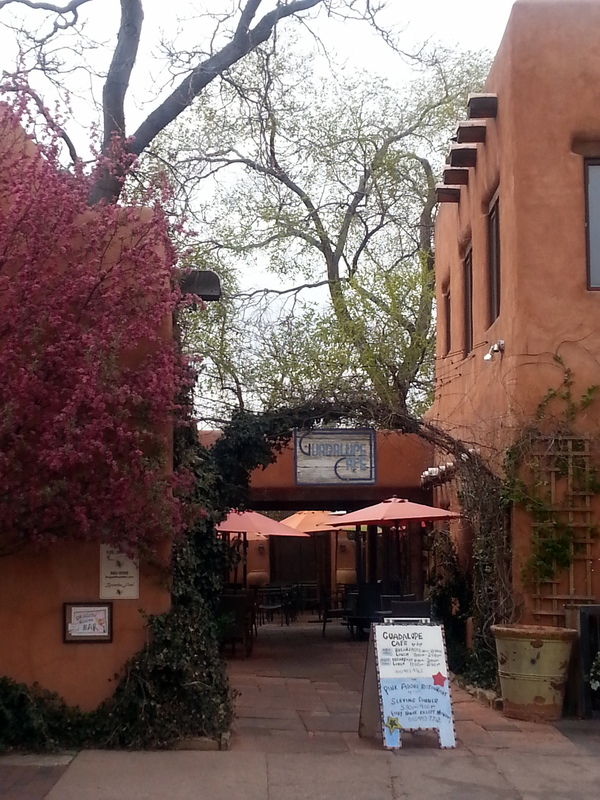 We want to explore Santa Fe, and don’t want to drive. This park is right on a bike trail, not 10 miles from the city. Right up our alley. If you’re not into photos, proceed no further. This is a big city with lots of BIG history. It boasts the oldest known house in the country (how telling that it’s a now a real estate office) The oldest church – built in 1610. 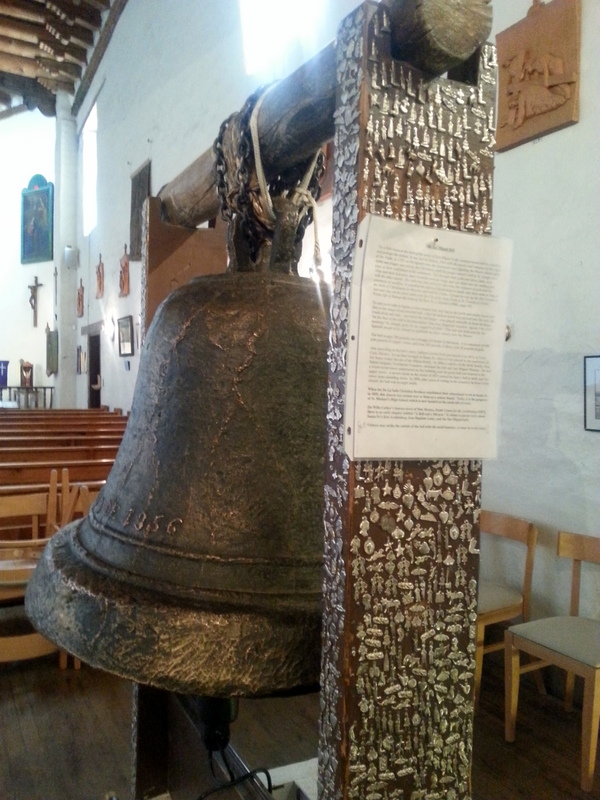 The original bell, which is now in the sanctuary was cast in Spain in 1356. I actually hit it with a small rubber hammer to hear its sweet peal. 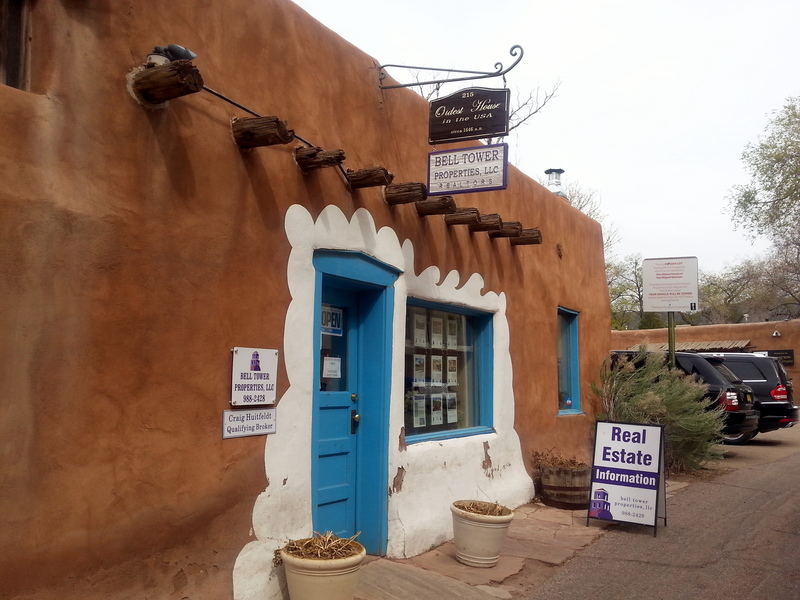 Santa Fe is also the oldest US State Capitol – didn’t get a chance to visit the Capitol building). 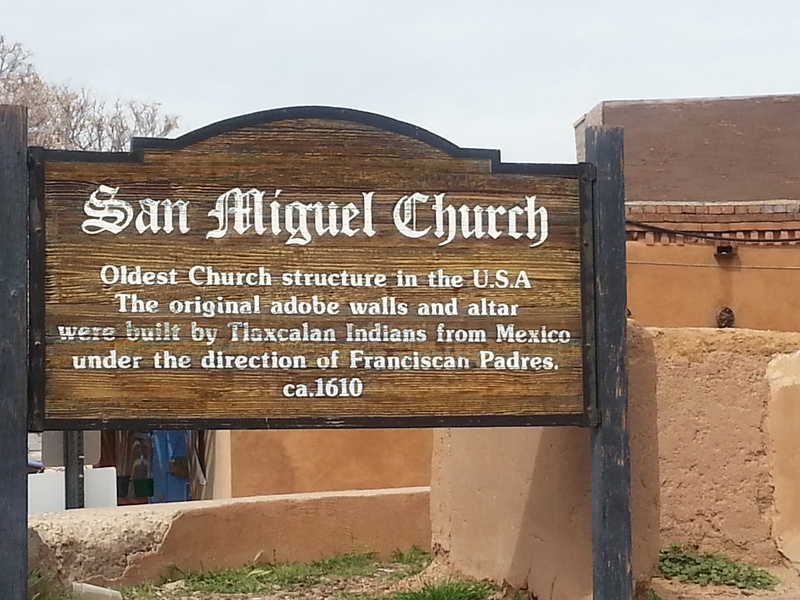 The Palace of Governors is also the oldest continuously occupied building in the US. 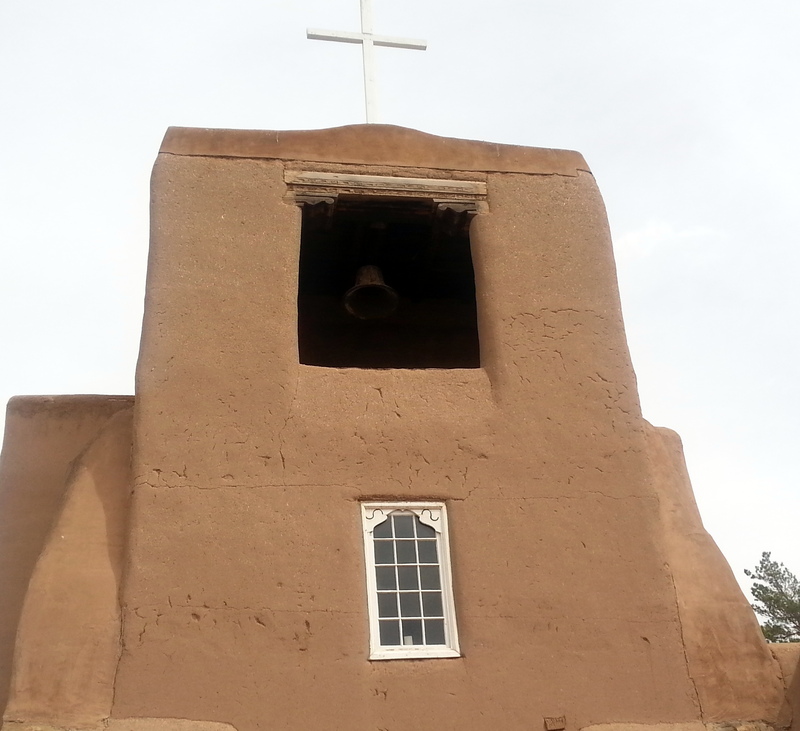 Constructed in the 1600s, it has seen many renovations. 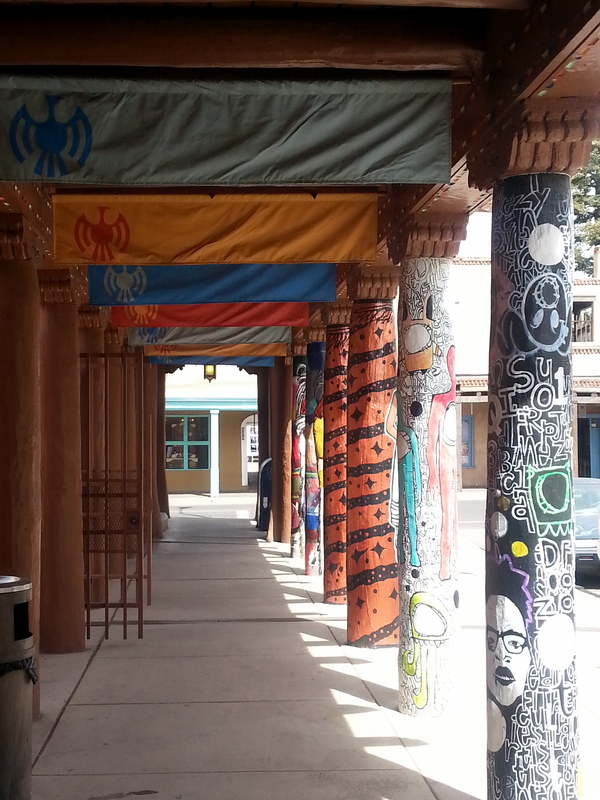 It now houses the incredible New Mexico History Museum (you could easily spend two days there). 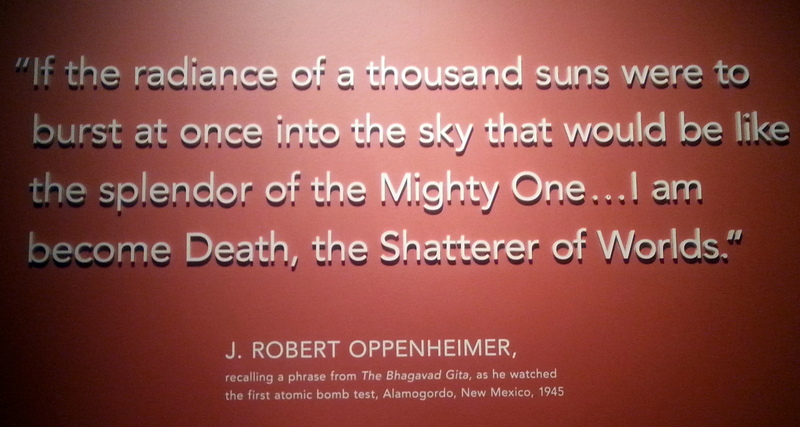 One section of the Museum was devoted to the Manhattan Project, the team that developed the first atomic bomb. 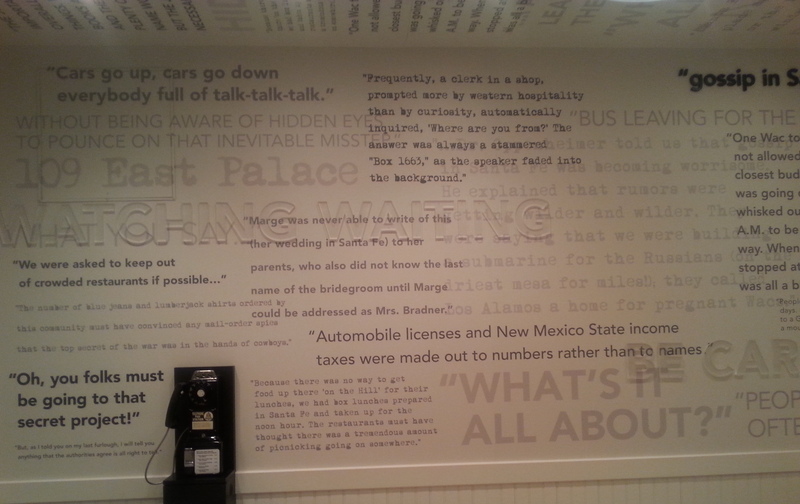 A stark white room is emblazoned with quotes from the scientists of the project and their families. It’s sobering to see. (There’s an excellent new book, written from the standpoint of the scientists’ wives. It’s called The Wives of Los Alamos by TaraShea Nesbit). It was enlightening to have read this just a few weeks before seeing this area. 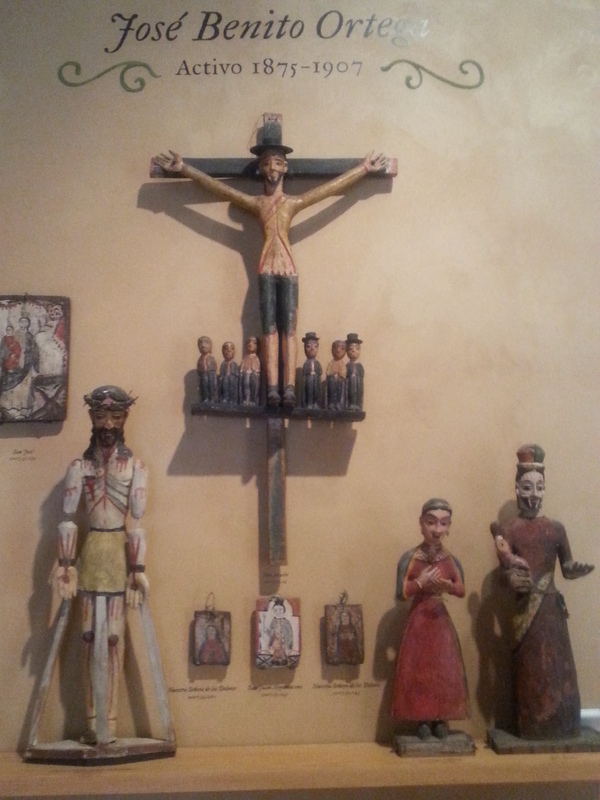 One area of the Museum was devoted to a collection of religious artifacts from the early church and missions. 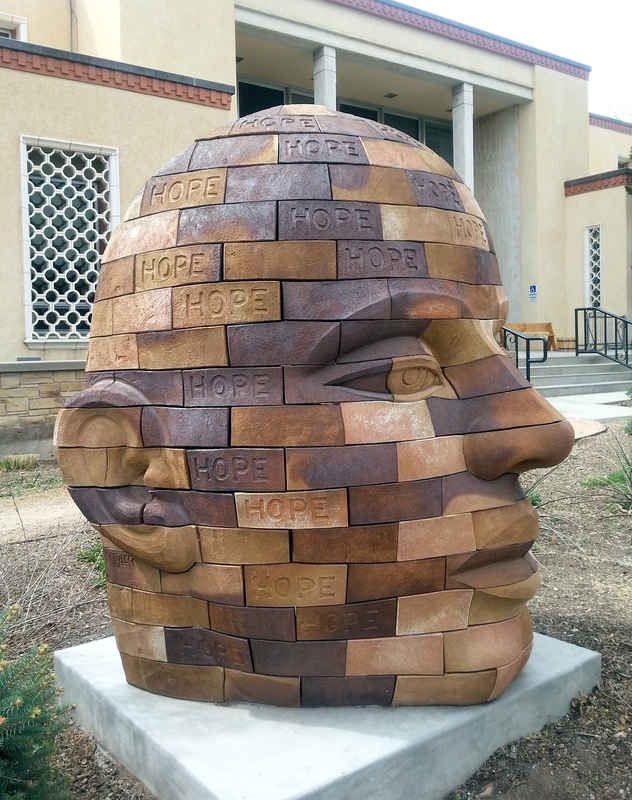 It was stunning to see these sculptures, with their faded colors in such a huge assortment. 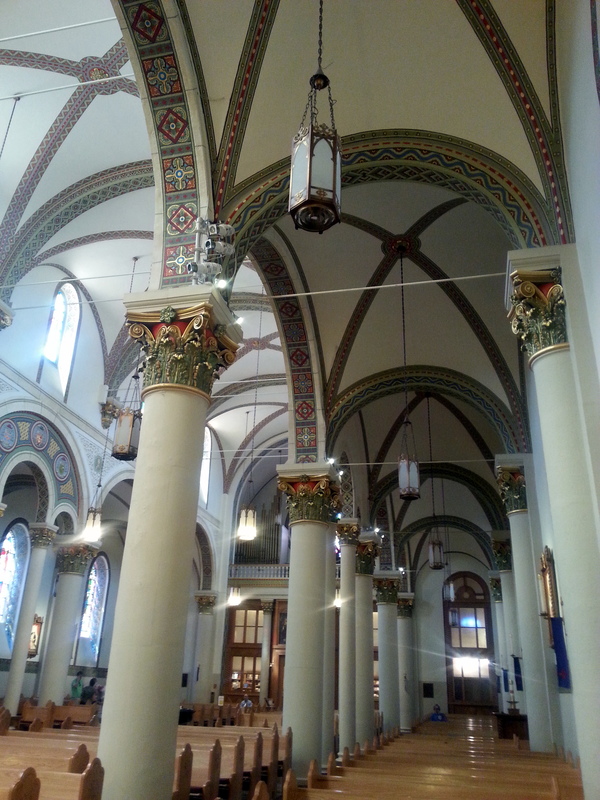 I spent an amazing amount of time in these galleries. We visited the Georgia O’Keefe Museum, and were surprised to find that most of our time there was spent admiring the photos by Ansel Adams taken during the time in the ’50s that he spent with O’Keefe in Hawaii. 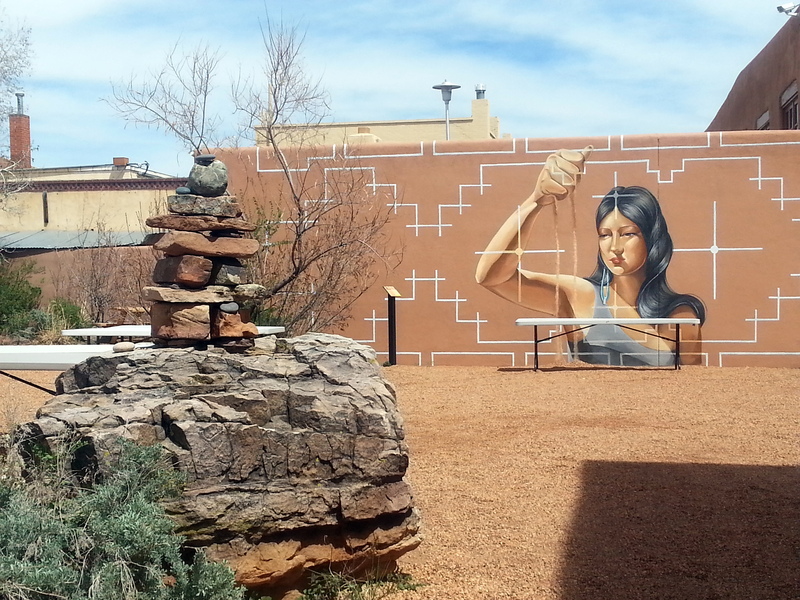 The next day, I visited the impressive Museum of Contemporary Native Art. 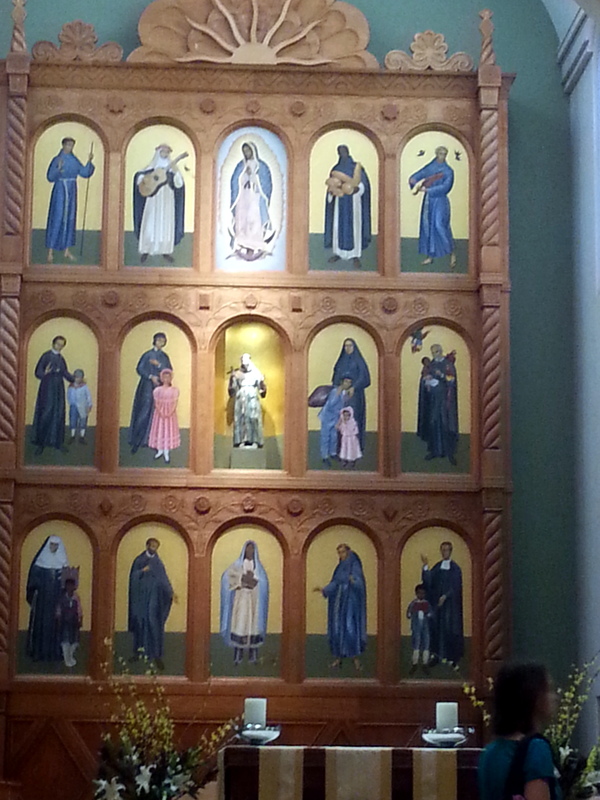 The Basillica of St. Francis of Assisi got plenty of our attention. 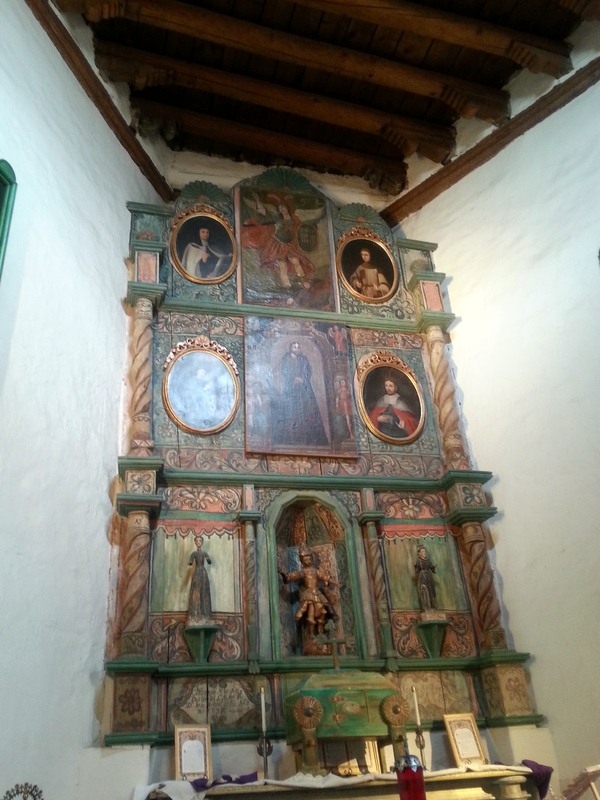 The old Mission churches of the Southwest use such vibrant color. They draw are warm and welcoming. 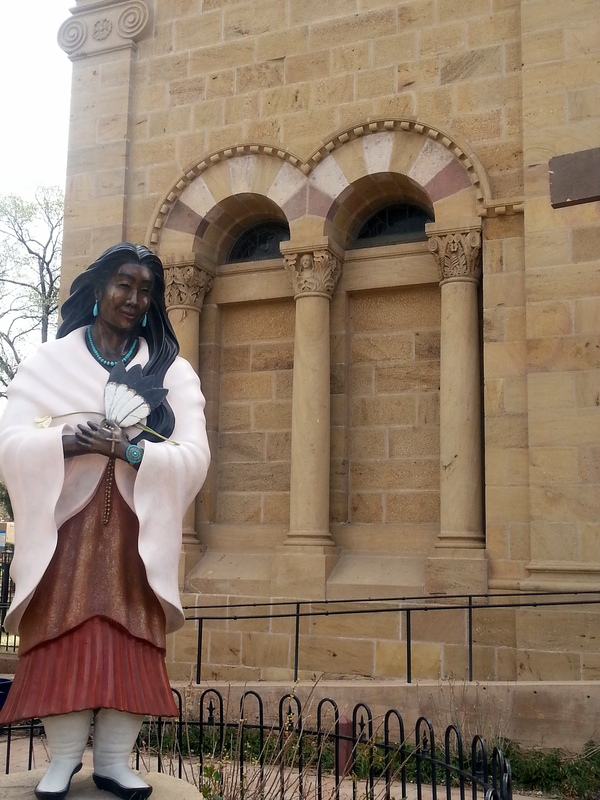 I’m not Catholic, nor a church-goer, but I found myself wishing I could attend a Mass there, especially after seeing two Native American drums, and five (!) 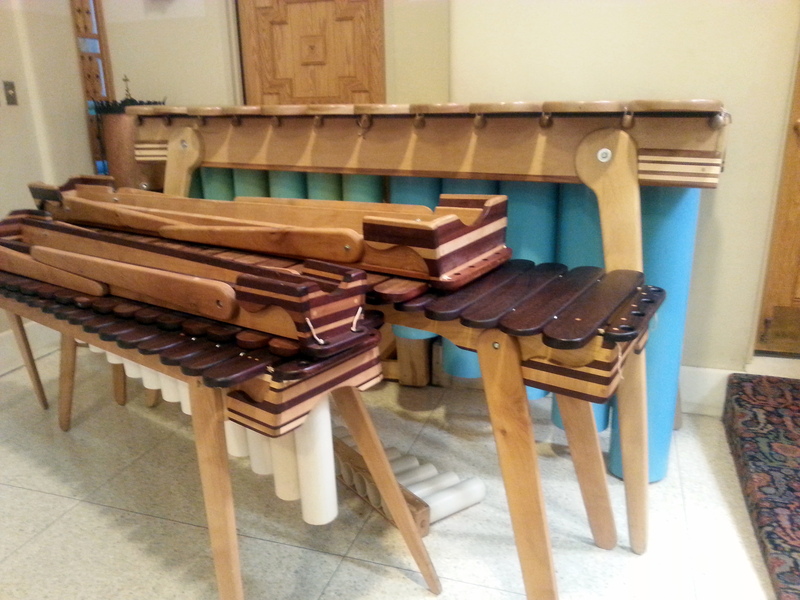 marimba-type instruments stashed behind the church organ. 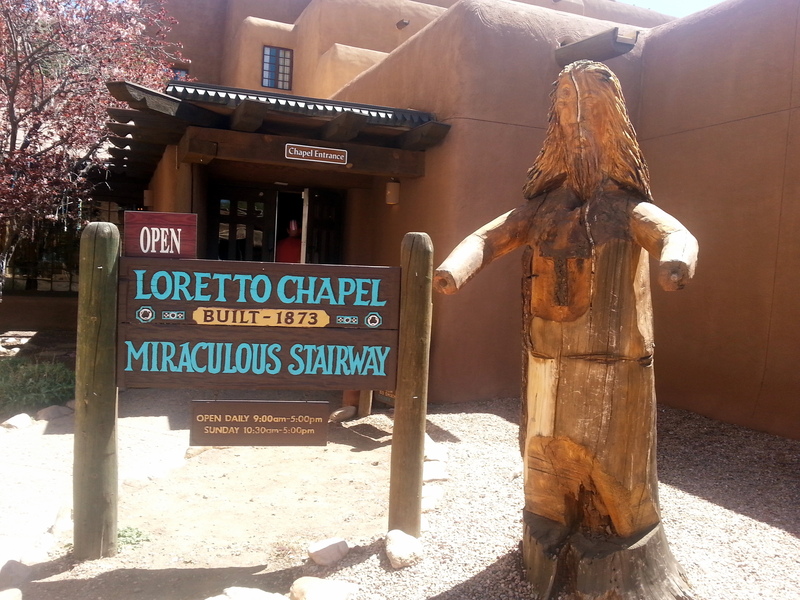 There’s also the Loretto, with it’s amazing floating staircase. 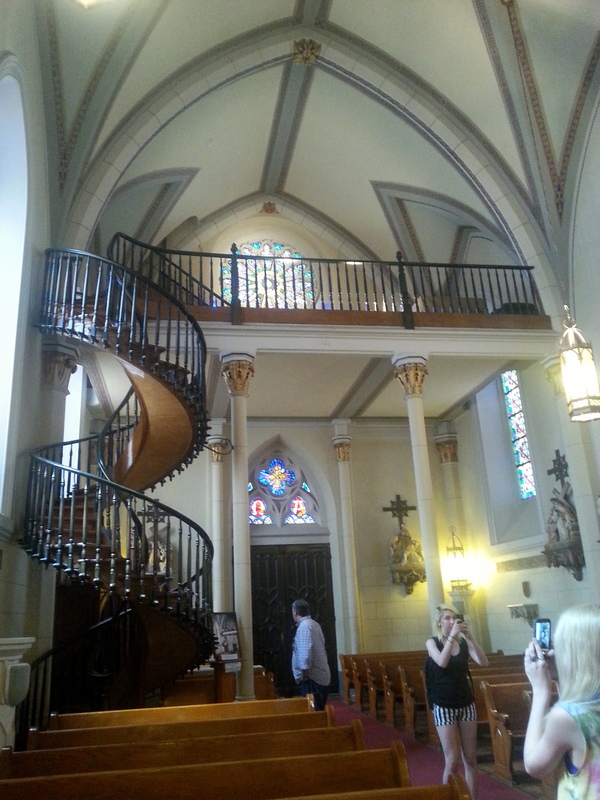 The legend is that the nuns prayed for a staircase to the church’s loft, to replace the ladder that was in use. During the nighttime house, an unknown craftsman came each day and built this amazing staircase, anchored neither at the top nor bottom, in answer to their prayers. 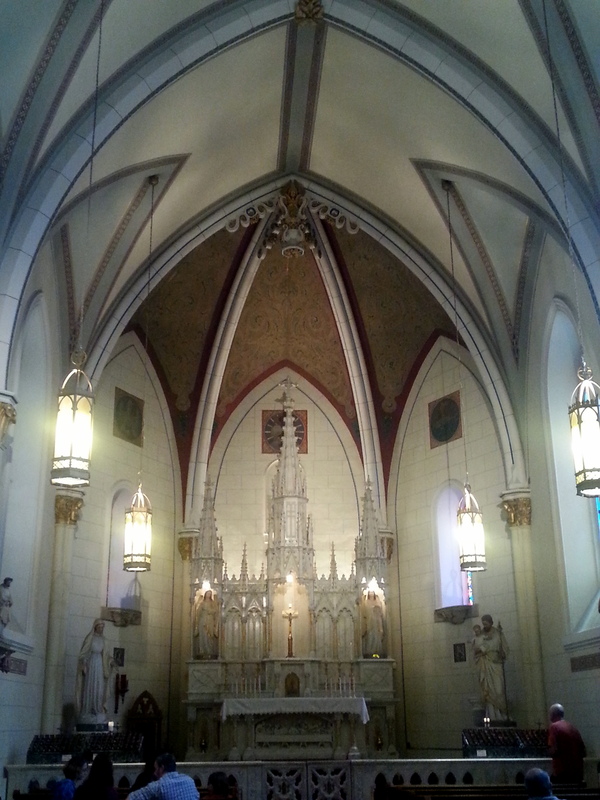 This church is reportedly the first Gothic structure to be built in the US, modeled after Sainte Chapelle in Paris. 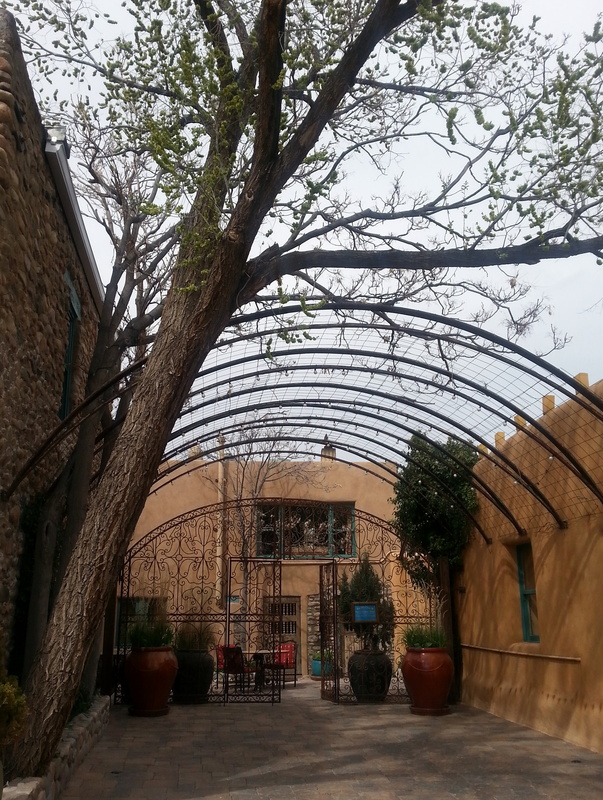 But, much of the beauty of Santa Fe is in the sheer joy of the outdoor space. Colors play against the clear skies, sculpture and parks draw people who gather and actually talk to each other. It’s a joyful, colorful, hopeful place. I really had to tear myself away to head back to camp after traipsing around for six hours. 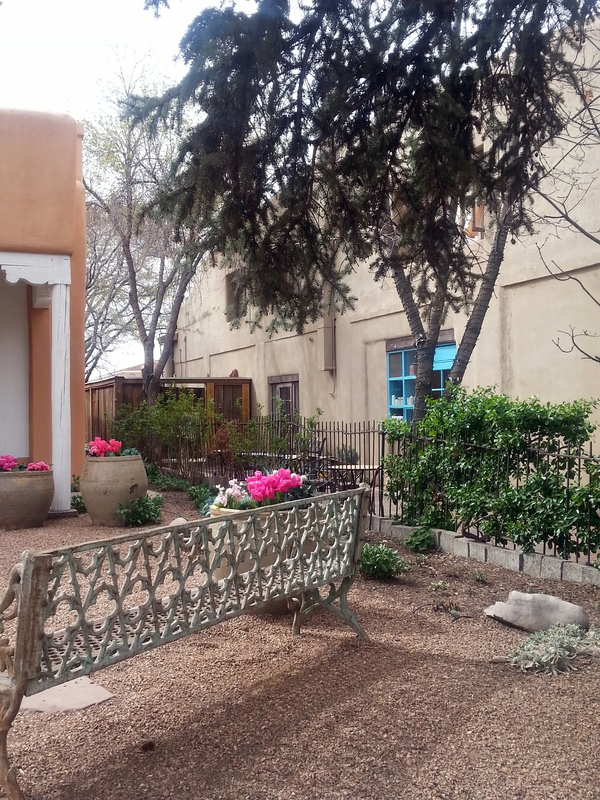 With all the history, much of the sheer joy (to me) of Santa Fe was in the beauty of the Spanish-influenced architecture, surrounded by spring gardens. 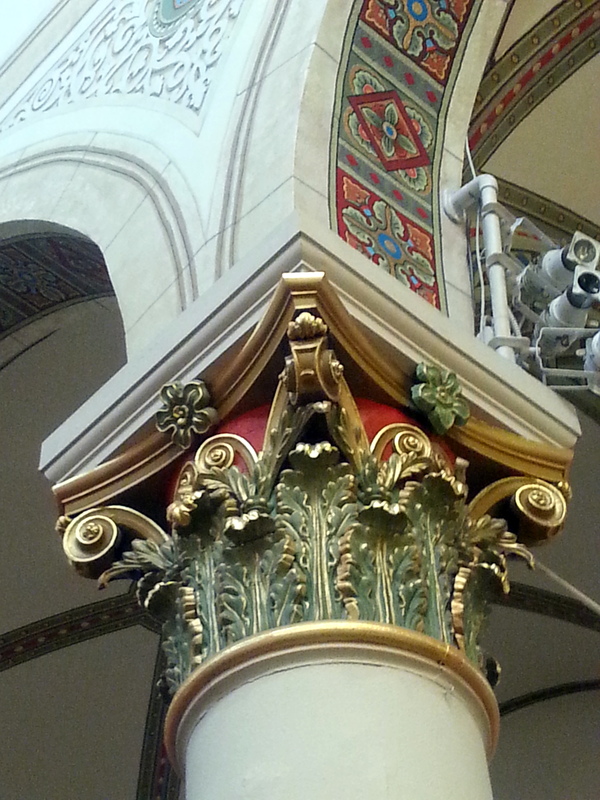 Abundant color and welcoming spaces are everywhere. A better, more patient photographer would be a better tour guide than I am. But, you gotta go with what you got. So here’s the rest of the tour. 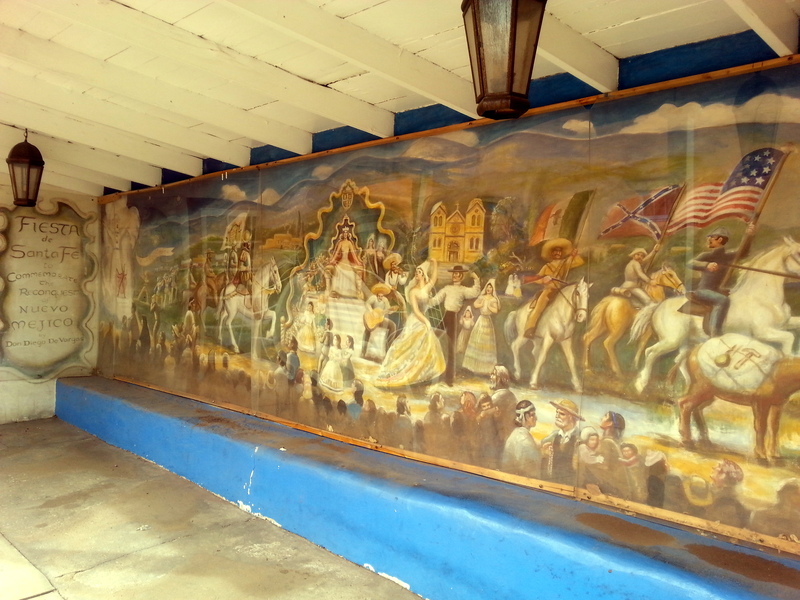 A Vargas mural (outdoors) Beauty everywhere. 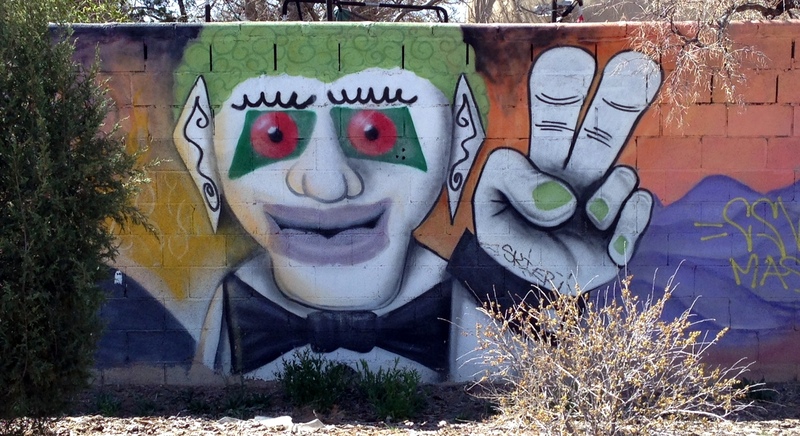 And a special shoutout to the painted wall alongside the bike path as we neared the downtown area. 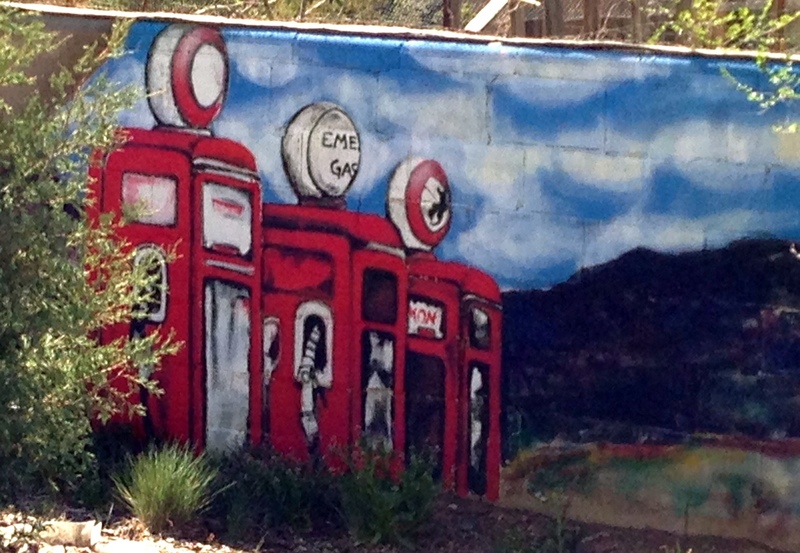 Whether these were sanctioned or graffiti, they had our attention, and appreciation. And these unique pillars alongside some of the bus stops (why would they glorify cars on a bus route? We couldn’t quite figure that one out). OK, enough! 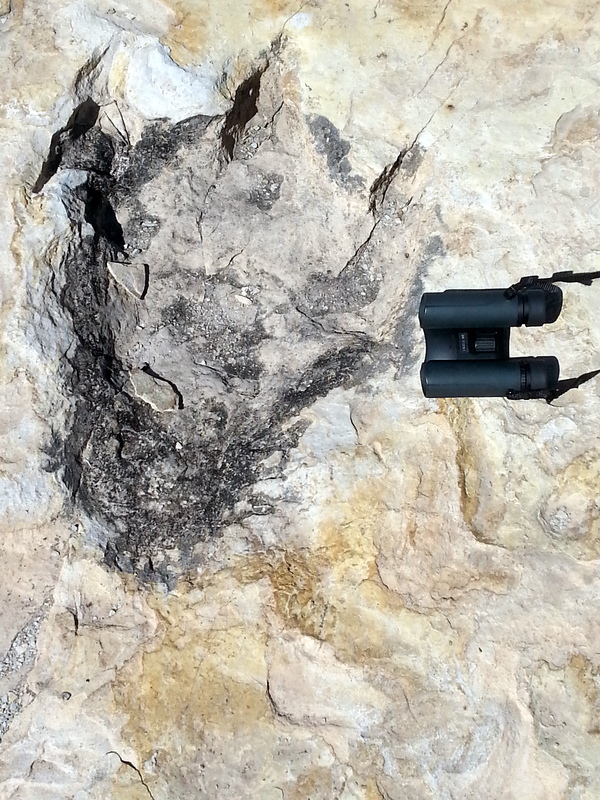 Next stop, some remote State Park in the NE corner of New Mexico with dinosaur tracks! First, some unfinished business from Bayfield, CO. 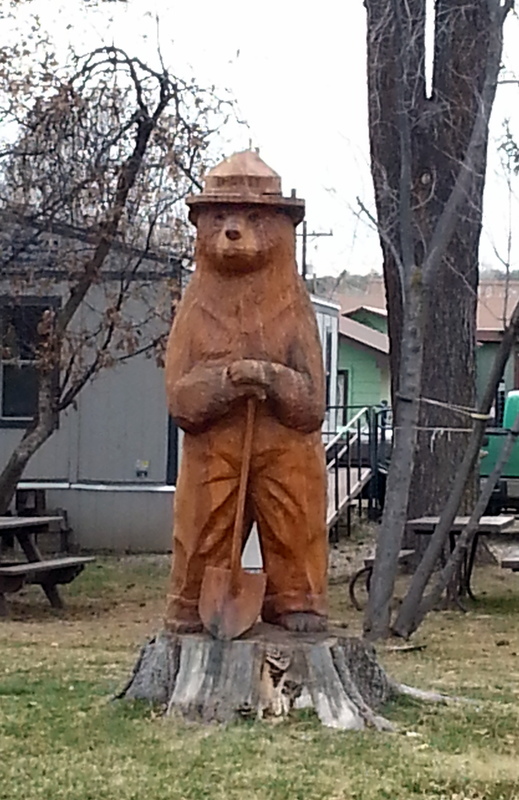 When we walked by the National Forest Service office there, we noticed an enormous Smoky the Bear tree stump carving. Too good to let it pass without a photo. 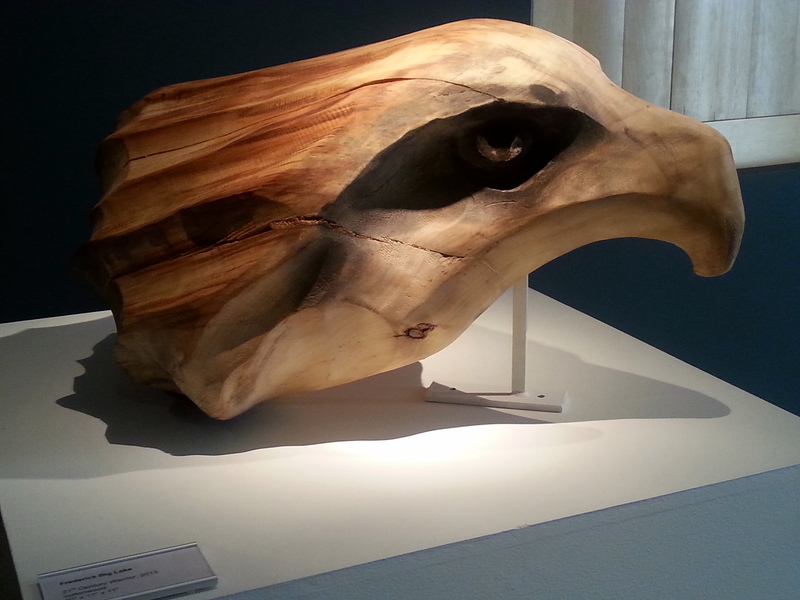 It was beautiful – no info on how old it was. 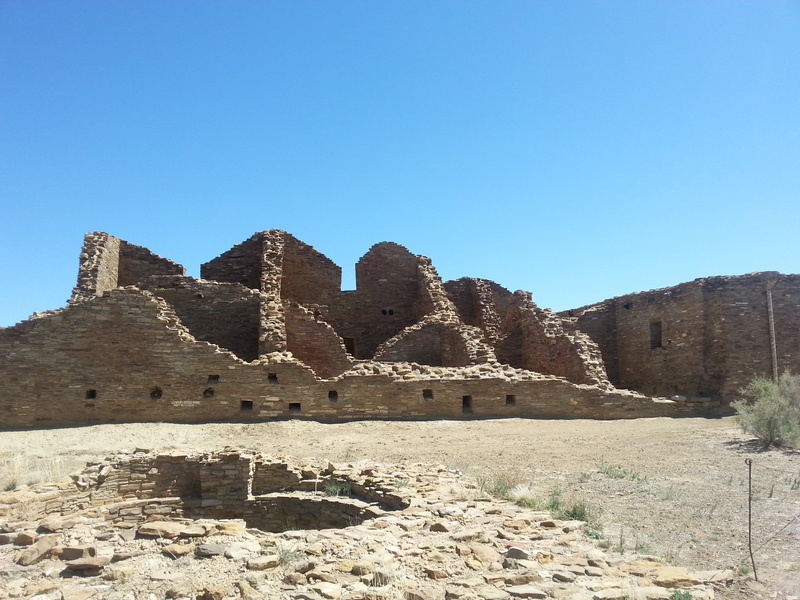 Onward to Chaco Culture National Historical Park. 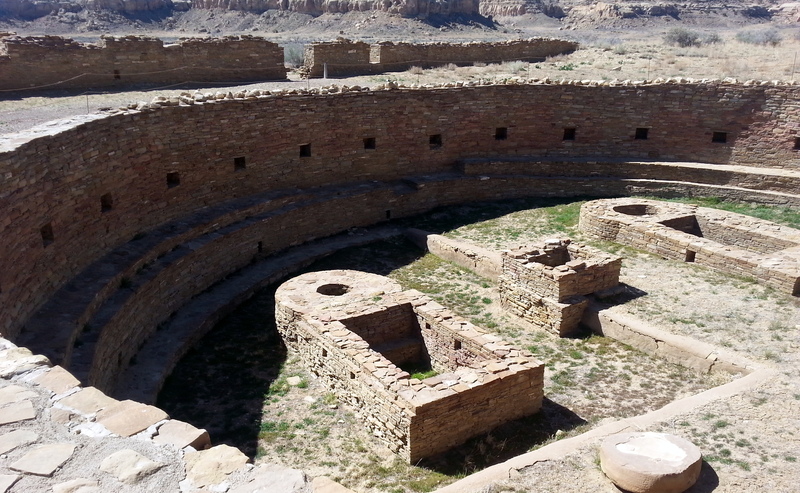 The Chacoan complex was a major center of Puebloan culture for about 300 years, beginning in the mid-800s. 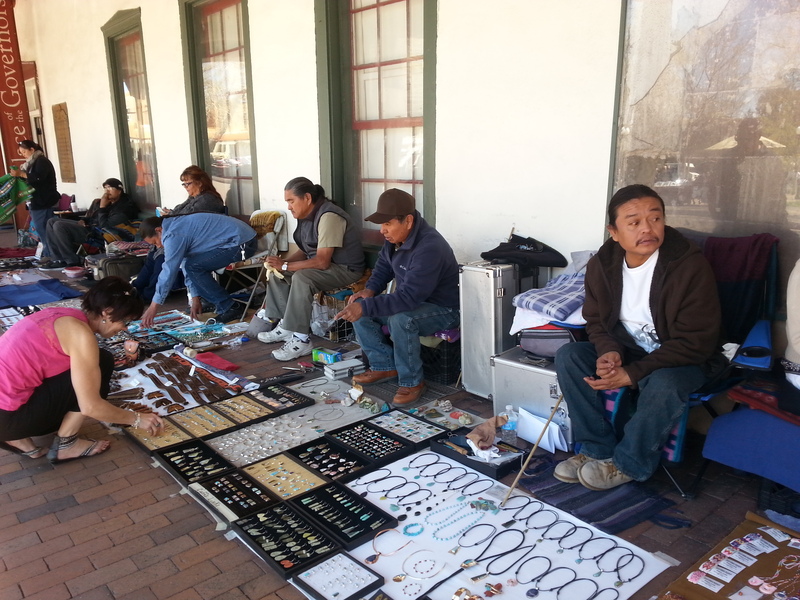 Both Navaho and Hopi today are descendants of the early Chacoans. 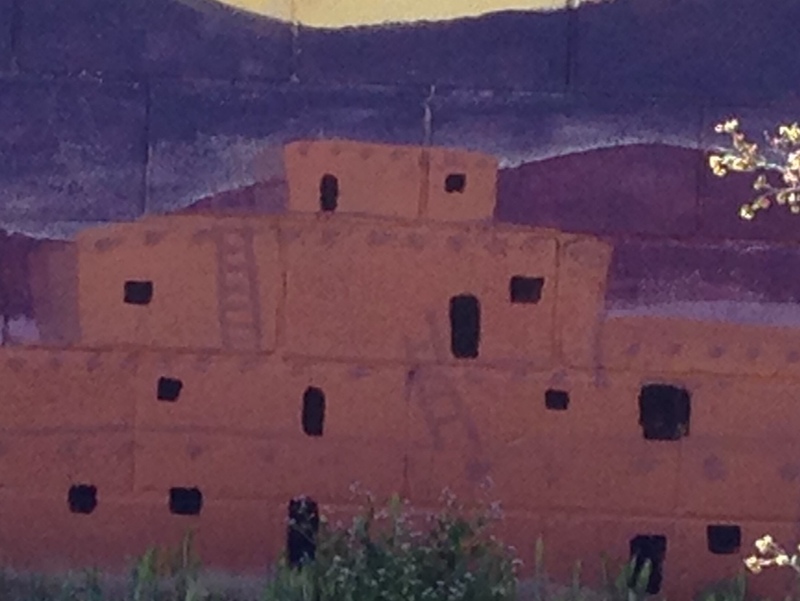 Many smaller pueblo villages are contained in the valley, most buried beneath centuries of sand and desert growth. 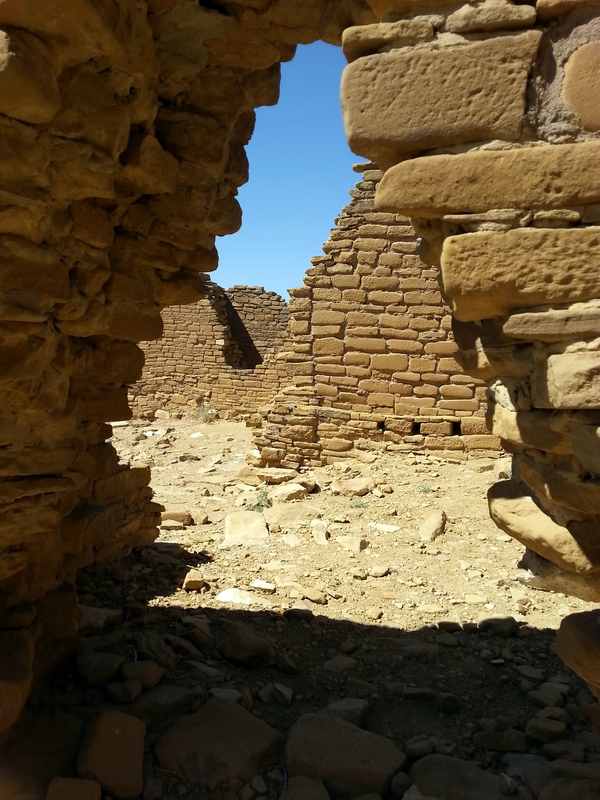 But, most of the attention is centered around the great houses, enormous pueblos with hundreds of rooms, perhaps home to up to 2000 inhabitants. Pueblo Bonito is the largest and oldest of these – at least four stories high, with over 600 rooms. So much is unknown about the function and use of the various areas of the great houses. 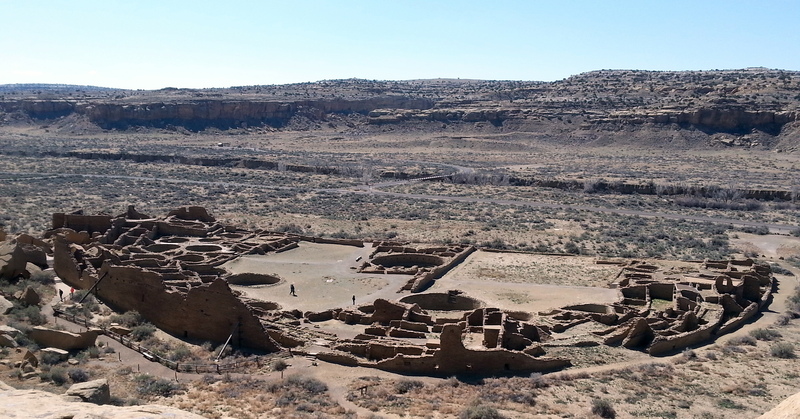 That Chaco Canyon structures were built 1000-1200 years ago and are still standing to a large part, is mind-boggling. Repairs and some limited reinforcements are ongoing. 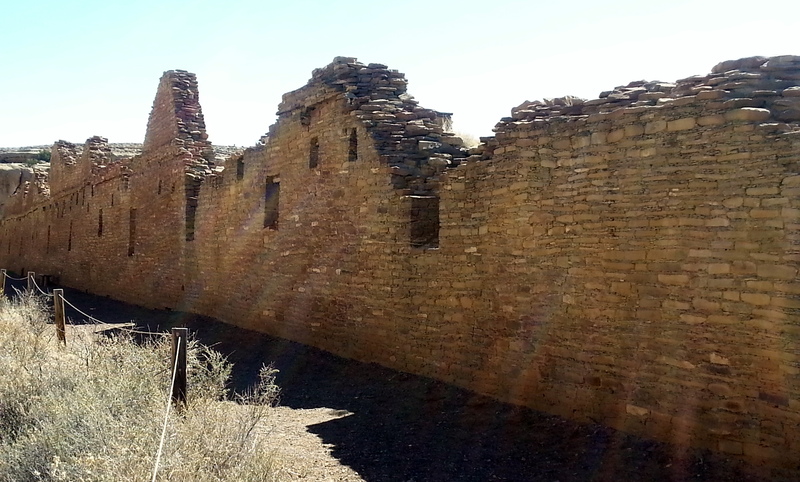 Pueblo Bonita, the largest of the Chaco great houses, was the largest structure in the United States until the 1880s, when it was surpassed by an apartment building in New York City. 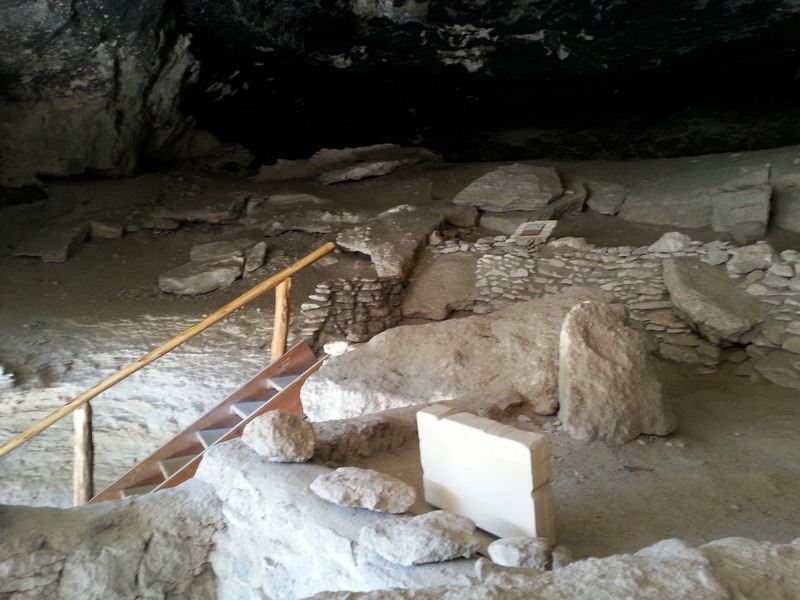 Many of the structures have been weakened by excavation, and have been reburied. 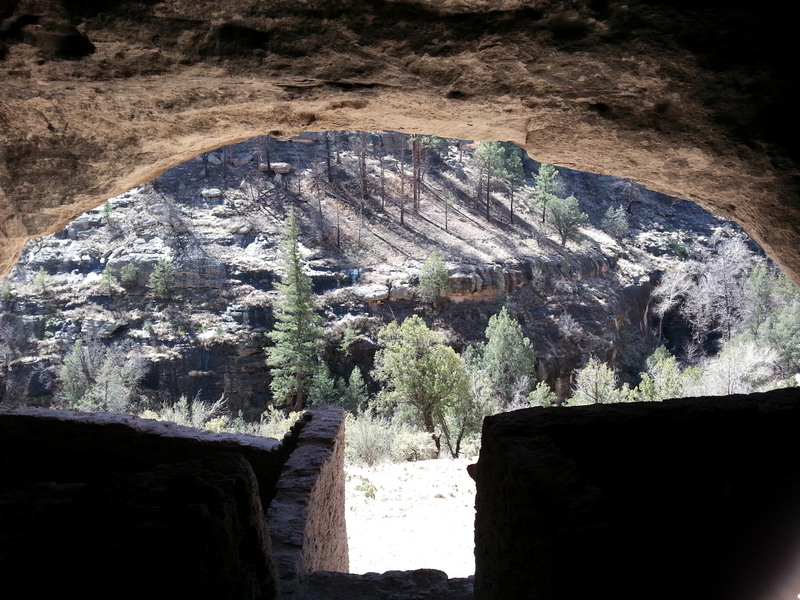 Mounds throughout the Canyon area almost all buried pueblos. There are dozens of them. 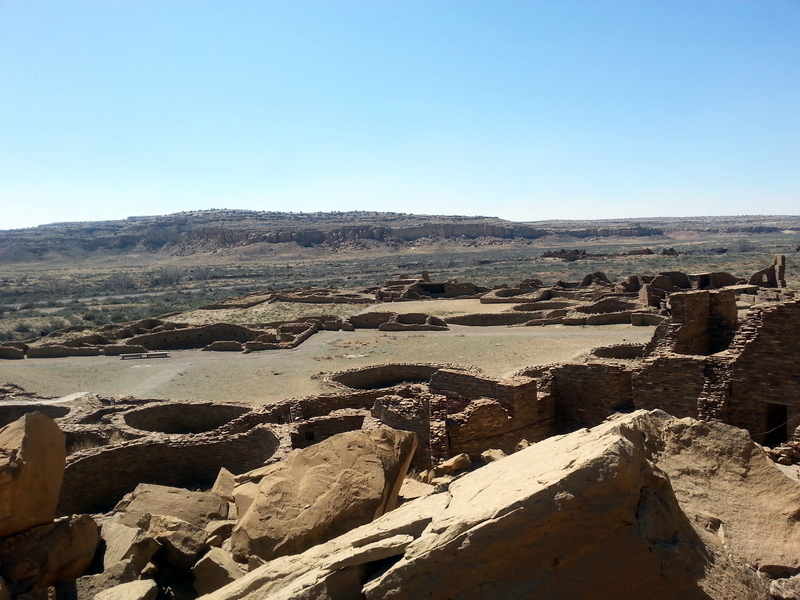 Chaco Culture National Historical Park was added to the list of Unesco World Heritage Sites in 1987, in recognition of its value to humanity. One the big questions is why the area was abandoned after 300 years. Drought is one thought – climate change and/or the lack of water to support the increasing population led to abandonment. 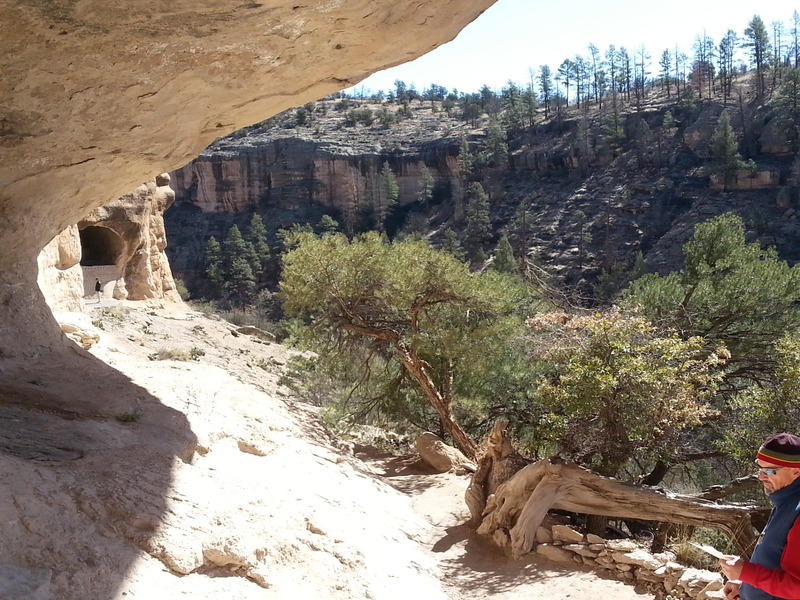 We decided in advance to ride our bikes around the Canyon, stopping at each overlook or site to explore. For two days, we suffered in the cold and wind – getting back to the Fireball each day, scraping red dust from our eyeballs. But, the last day, the wind disappeared, and we had a wonderful day to explore. 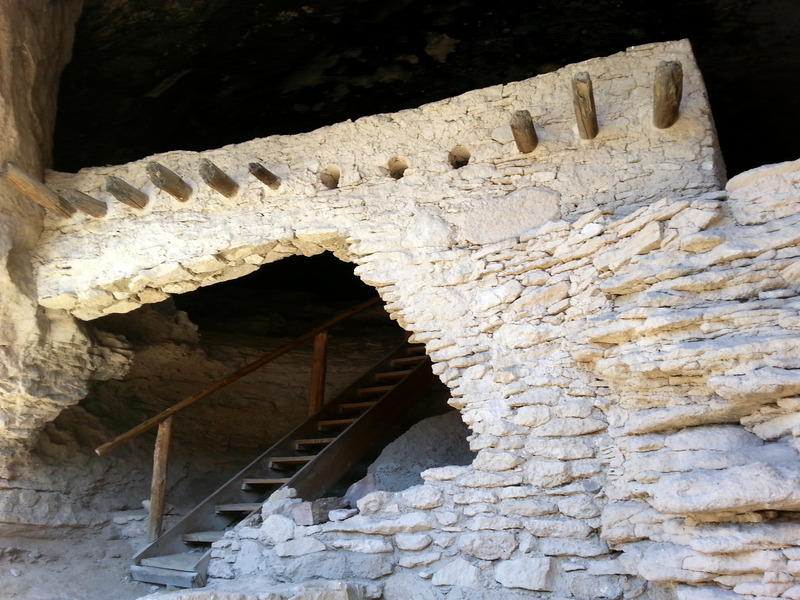 One marvelous sight was an ancient Chacoan staircase built into the side of a cliff. 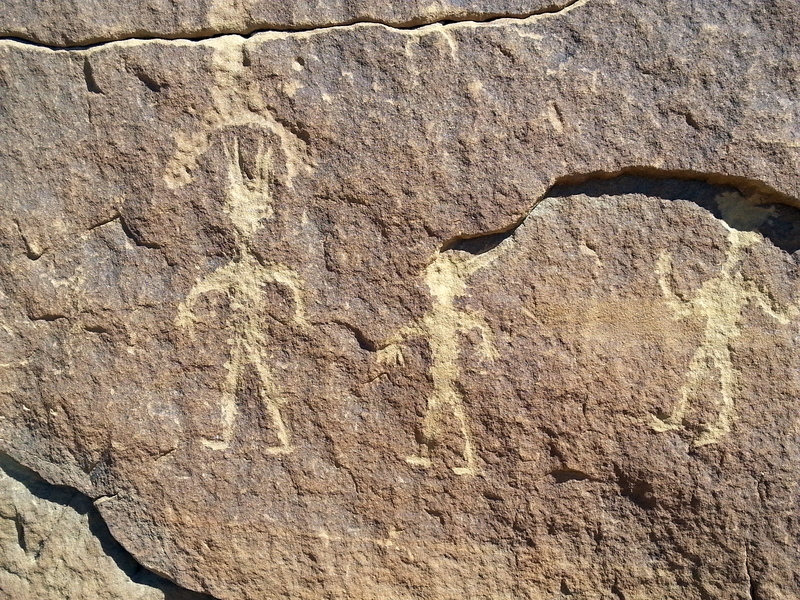 One of the highlights were all the petroglyphs and pictographs, especially the famous pictograph of the Supernova that appeared in approximately 1250. 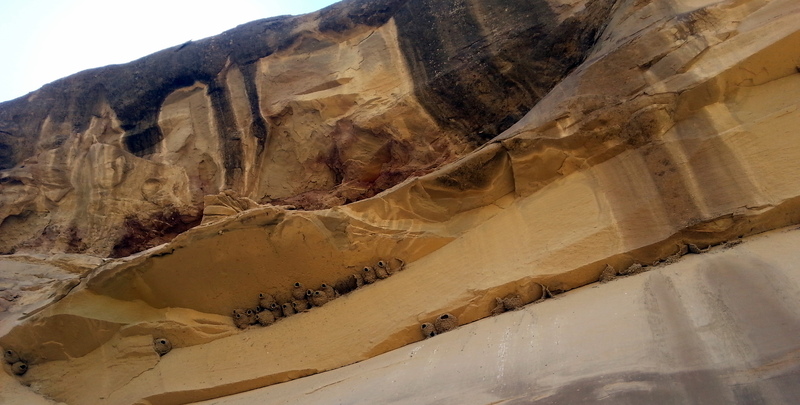 That same day, we saw dozens of nests of the cliff swallow, mud structures stuck high under rock ledges. 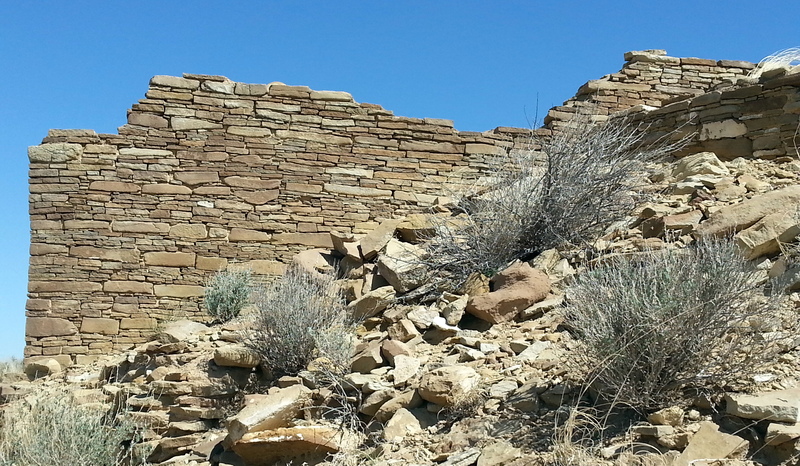 One thing about Chaco Canyon? You REALLY have to want to go there to endure the drive. Never have we been on such horrific roads – washboard doesn’t begin to explain the surface of the last five miles closest to the Park entrance. 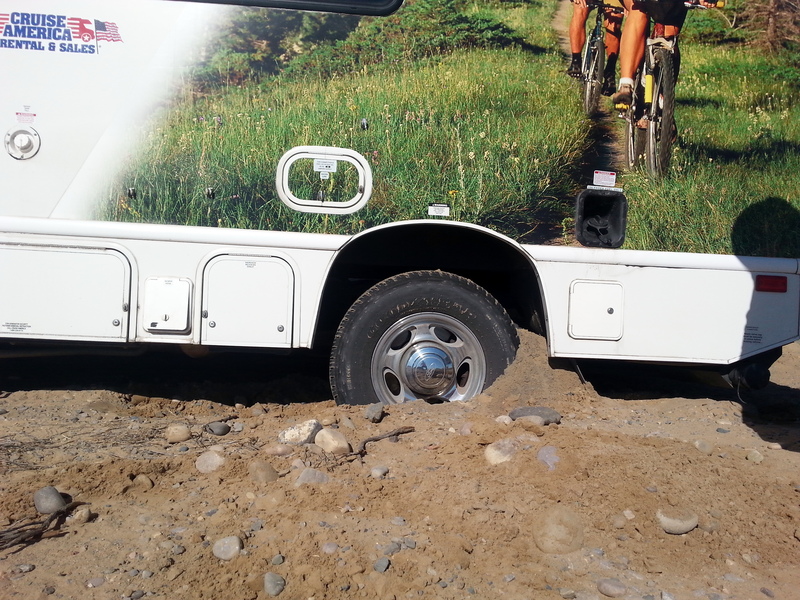 On our way out, we encountered two guys in a rental RV who had gotten caught in the soft surface at the edge of the road, and buried their RV. After an hour of digging, pushing, and trying to tow it out, we finally had to throw in the towel. 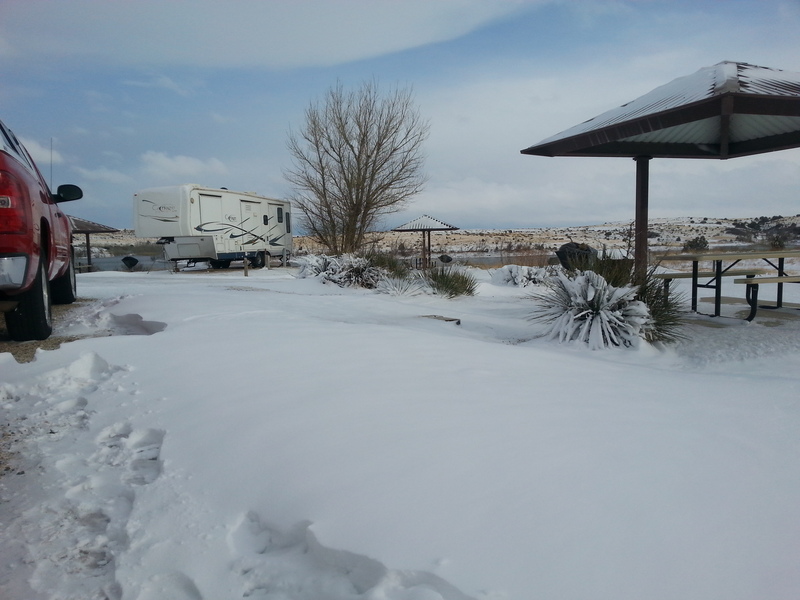 The entire undercarriage of the RV was buried. 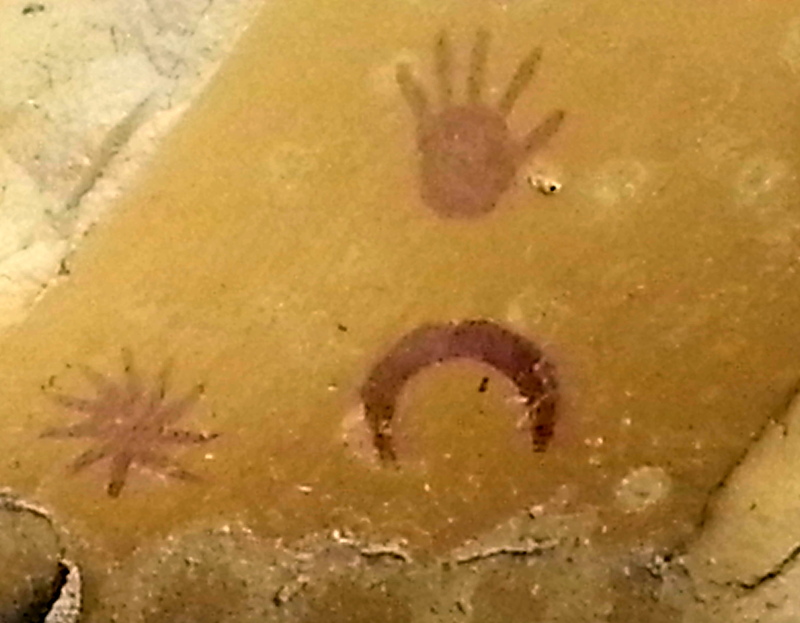 We left Chaco with many more questions than answers. It was a wonderful way to spend three days, expanding our knowledge. 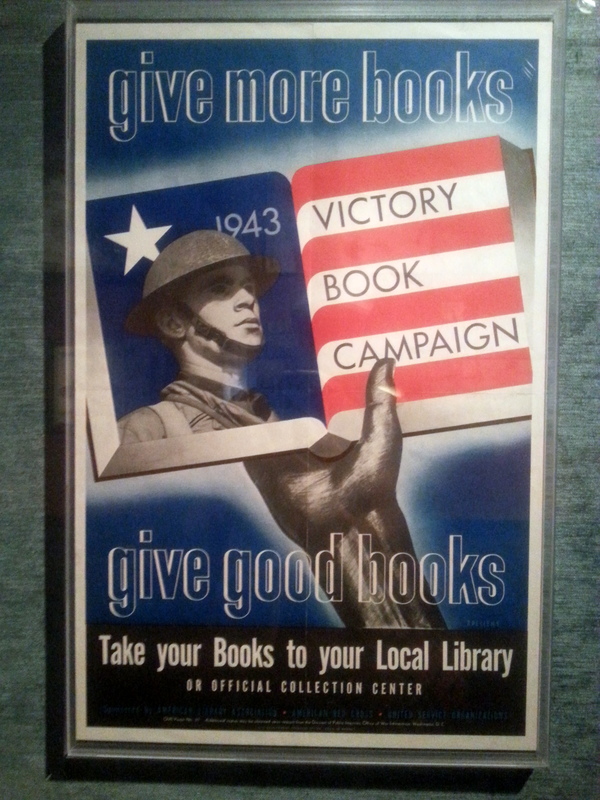 We both have new book lists on reserve at our home library, based on titles we saw at the Visitor Center. This was a difficult post for me to write – for these three days, I was like a sponge absorbing foreign material. The scope of of this canyon, and all that we saw is too extraordinary for me to really comprehend, muchless represent or explain decently. 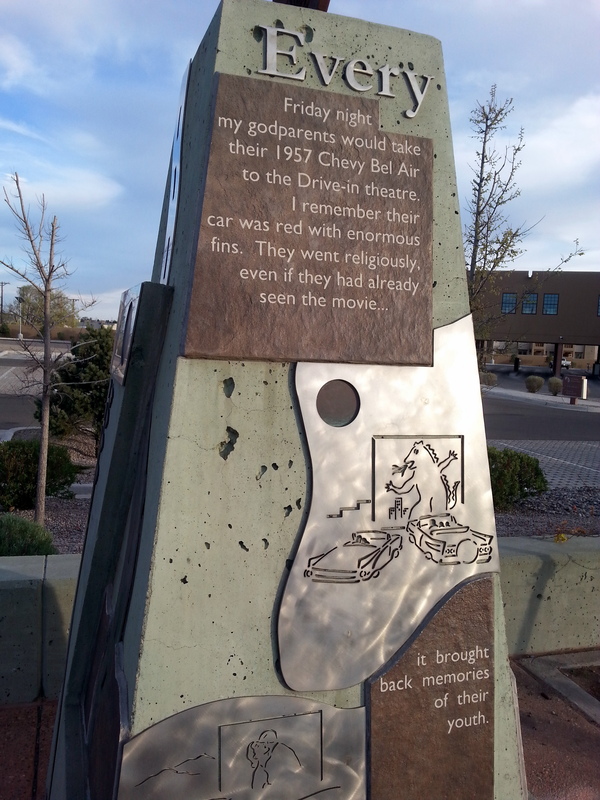 If you get a chance to visit, do so (but don’t take your Mercedes or Corvette).